Flying is all about The Atmosphere in the same manner that Sailing is all about The Ocean. 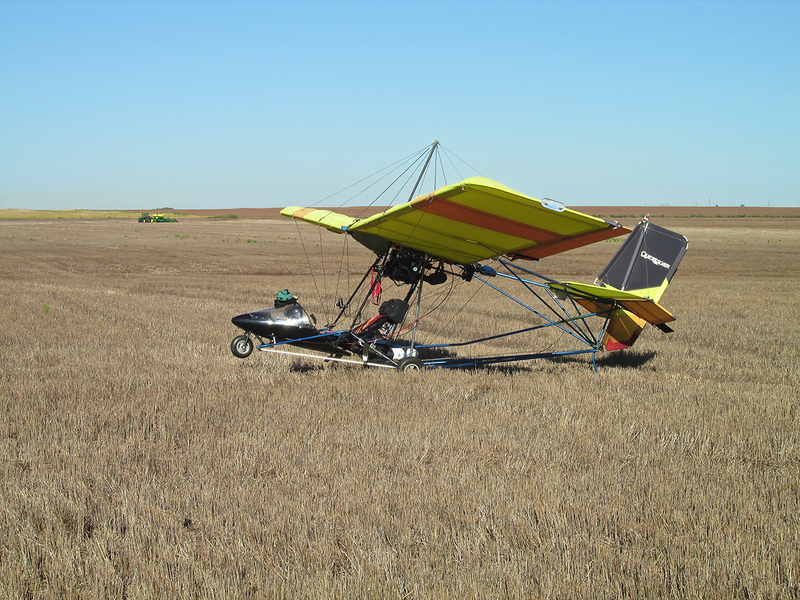 Fall in Kansas presents the Ultralight Flyer a variety of weather potentials. As Forrest Gump – Wise Prophet of Old – advised us, “You never know what you’re gonna get”. It can be cold. It can be warm. It can be windy. It can be calm. It can be humid. 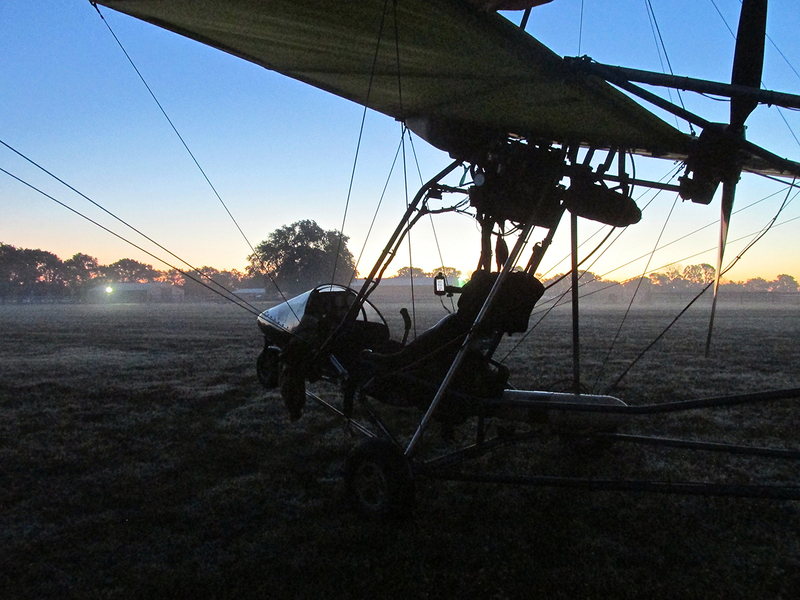 Just before Dawn, the MXL surveys an airfield high on humidity but devoid of wind. 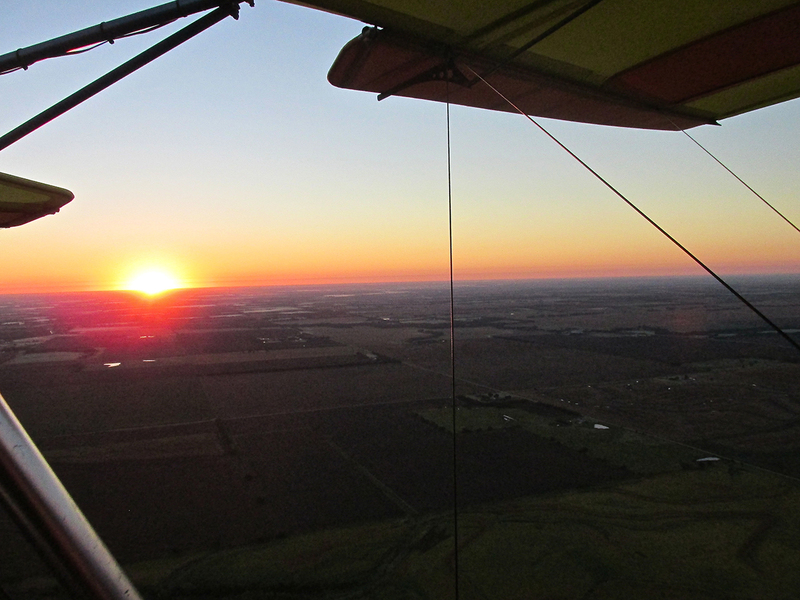 Over the Summer a flight to Waynoka was in the plans. A distance of 108 miles from my home field, it would be at the limit of my fuel endurance. Because of this I was waiting for the right atmospheric conditions to make this run. A slowly rising Southwest Wind would be required under which I could fly on the way there and that would give me a tailwind boost on the way home. The day before that Saturday Flight the Weather Soothsayers predicted the air I needed, so I prepared for the journey. 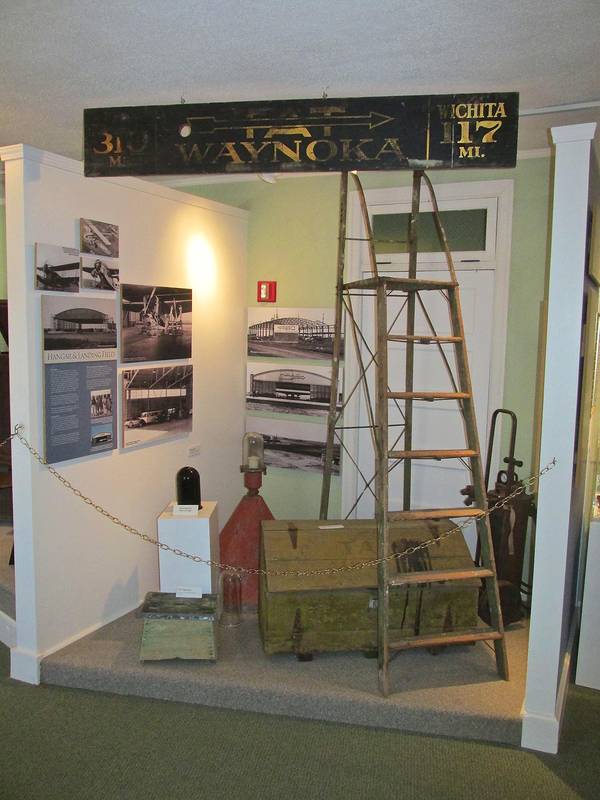 Prior to doing my Fun Flight research, I knew nothing about Waynoka – at least not by name. 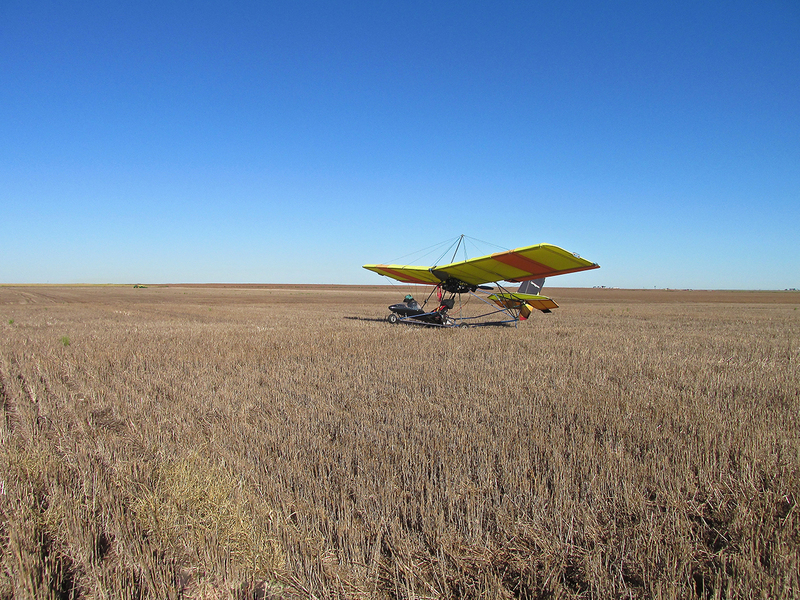 A year ago when I told people about my flight to the Salt Flats next to Cherokee, Oklahoma (“Salt Flat Safari”), just about everybody said, “Oh, did you see the sand dunes?”. At first I thought they were just flat confused. “Salt Flats” seems kinda like “Sand Dunes” if you are not listening carefully… Then I learned there are sand dunes in Northern Oklahoma. Frankly they aren’t that close to Cherokee but that started to make sense. 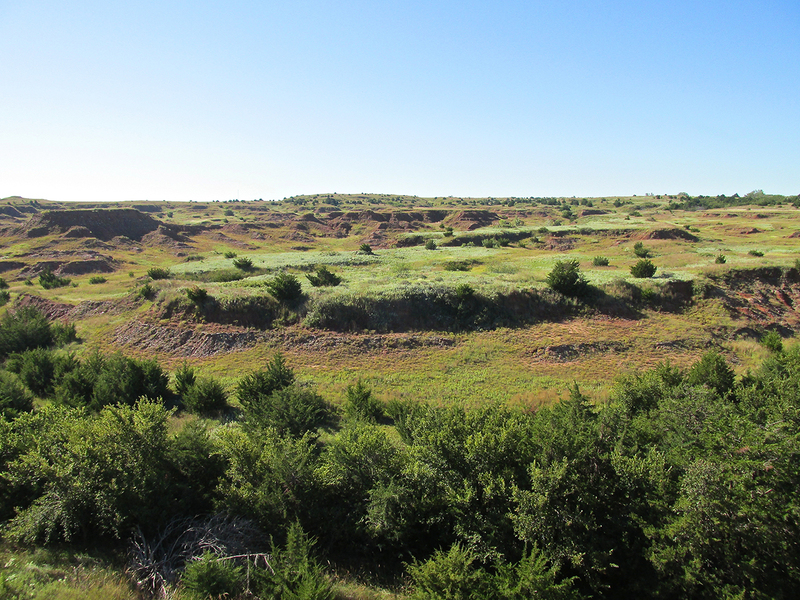 I had also heard of The Annual Rattlesnake Hunt in that area but had never connected it to Waynoka. So, all that – and more – would be revealed as this trip unfolded. After takeoff I noticed the hanging fog evident at my airfield was not a solo occurrence. 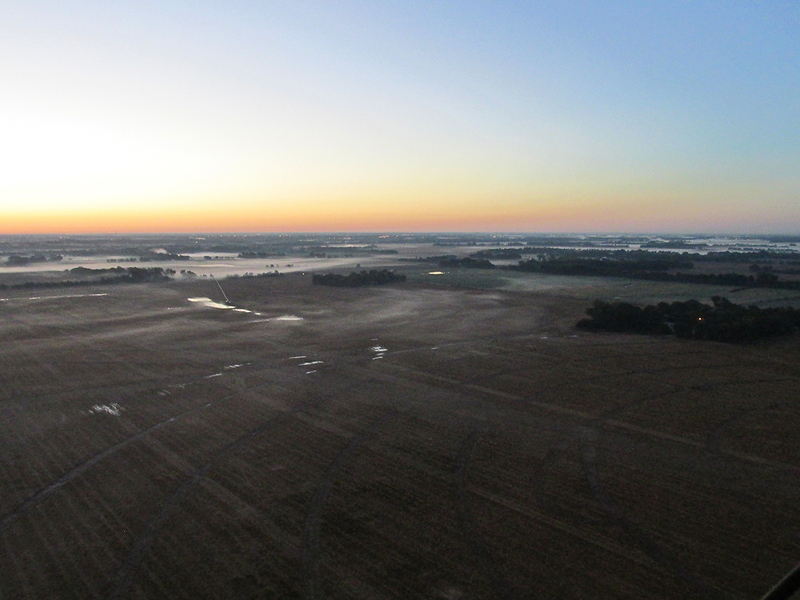 I have lived in Virginia, Oregon, California and Missouri in parts of those states where morning ground fog is common. 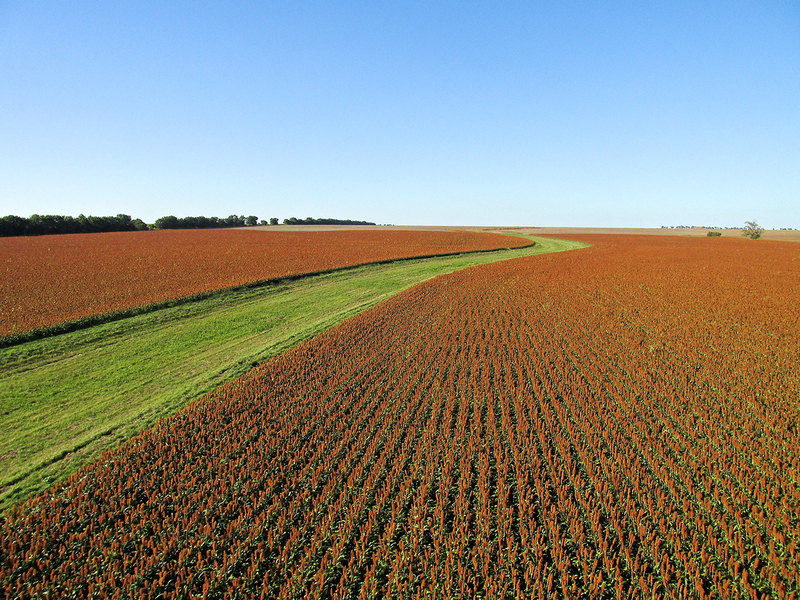 It is not a sight common to South Central Kansas. 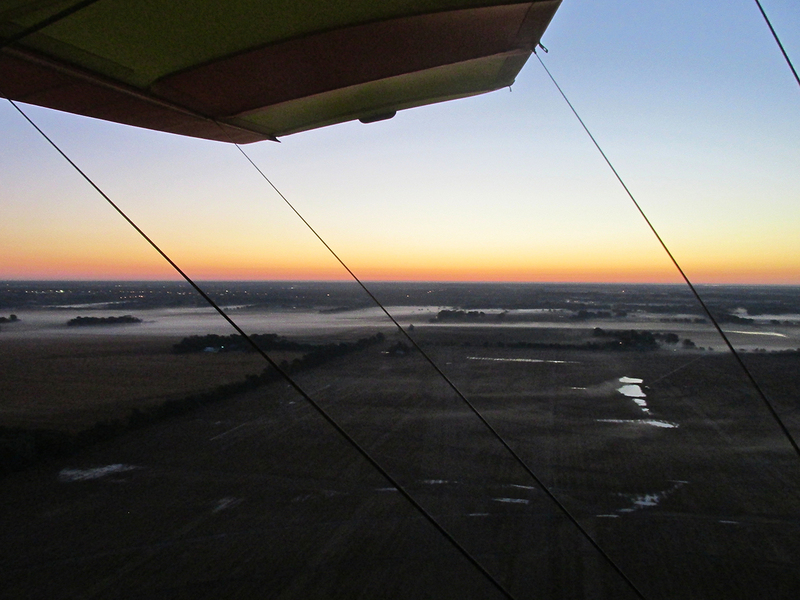 Coming off the Arkansas River, enhanced by the light of the rising sun, this fog was a sight to see. For a moment, I had to turn away from my direction of travel to capture these next images. 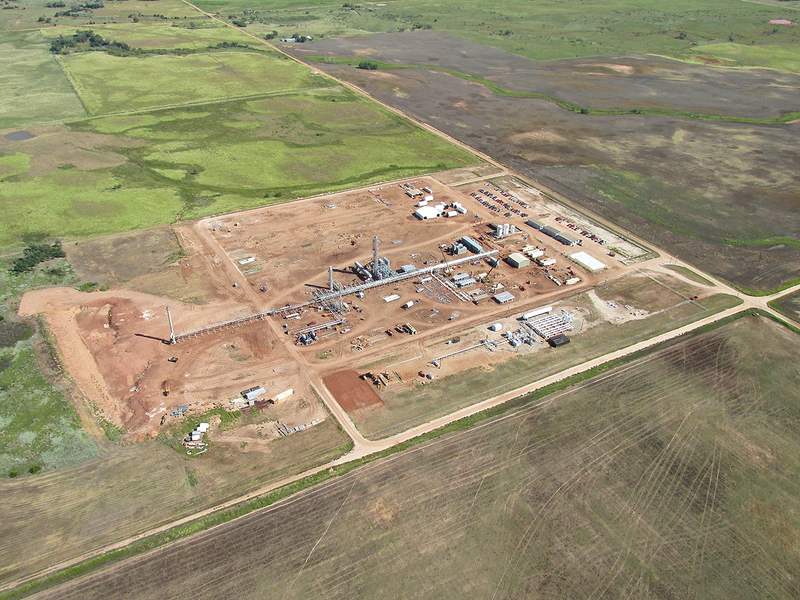 Looking Southeast from 1,000′ AGL. 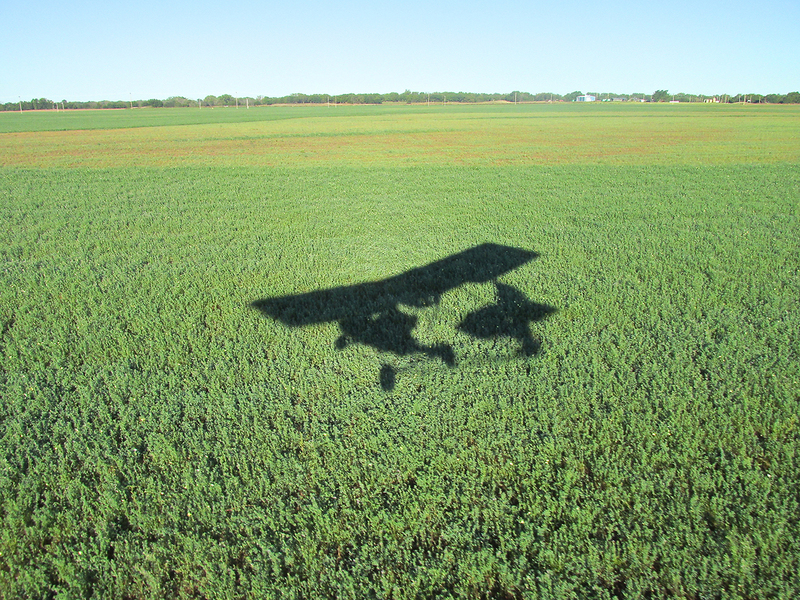 Under my Left Wing at 1,000′ AGL looking East. Minutes later after resuming my course, bright rays flashing under my wings alerted me to the Rising of the Sun. I swung around in my seat to get this out “the back window”. 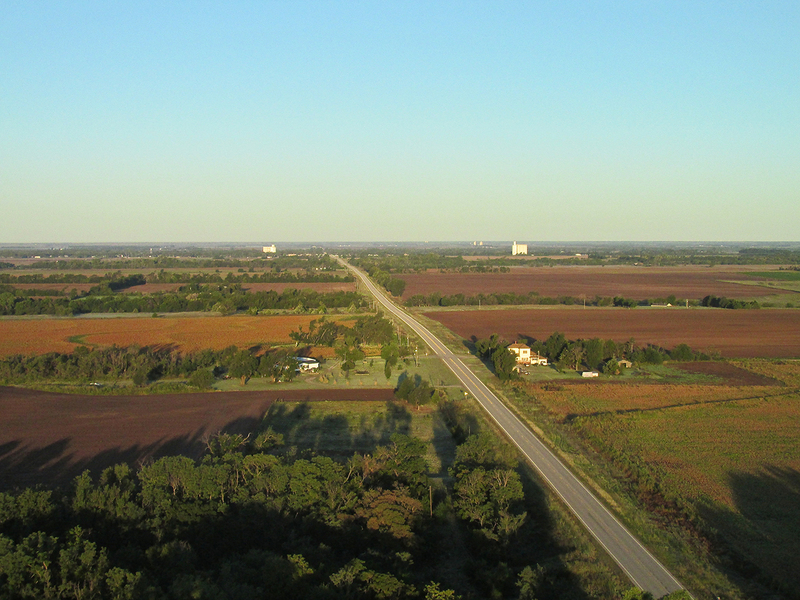 After passing over The I-35 Turnpike and the relatively dense rural habitations just Southwest of Selby Aerodrome, I settled down to a cruising altitude of 200′ to 300′ AGL. 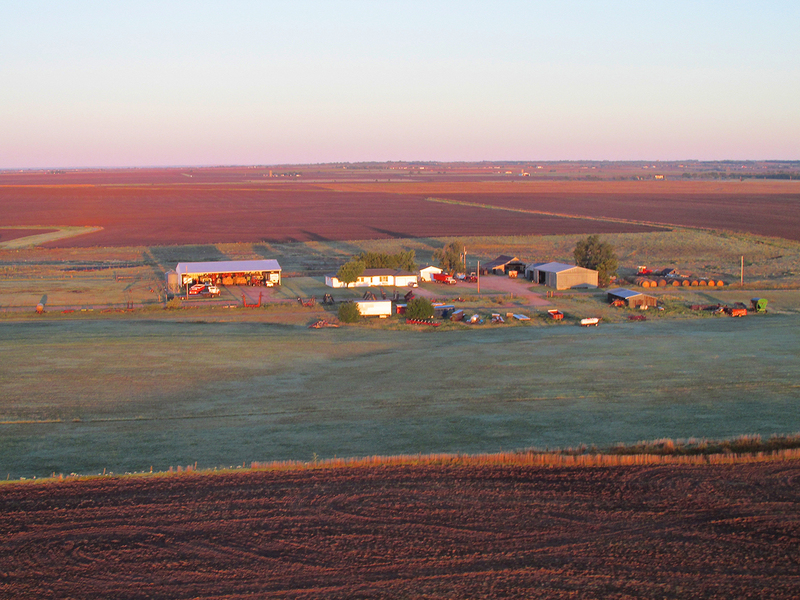 I liked the way the new morning sun played against the East side of this homestead. Clearwater Road heading into its namesake Clearwater, Kansas. I am at 200′ AGL looking West. 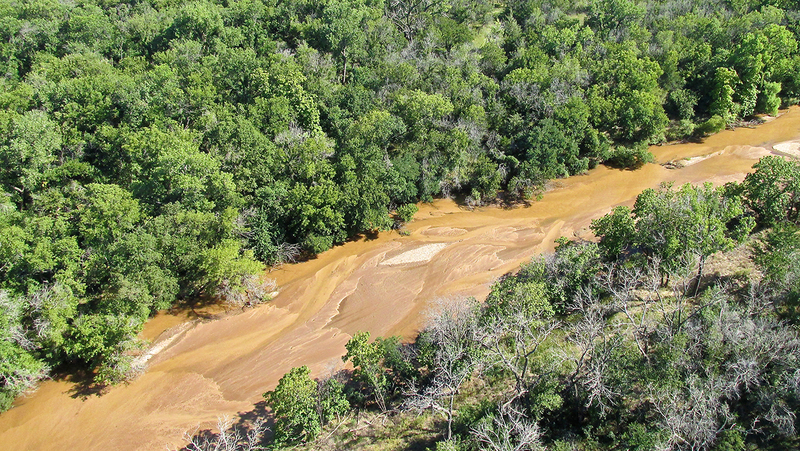 The Ninnescah River South of Clearwater. I am at 150′ AGL looking Northwest. 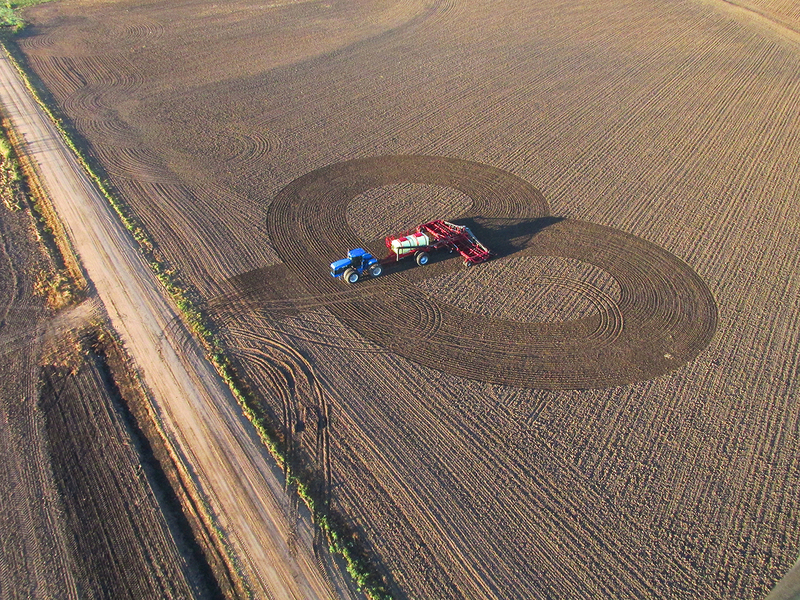 I can’t imagine any other reason the owner of this New Holland Tractor made this interesting pattern before shutting down than to give me an attractive backdrop for an aerial photo of the rig. Nice! About 15 minutes into the flight I made my first wildlife sighting. Three deer were milling about on a country road. I banked right to get a better look at them. Their choice of position had left them no cover so they circled around the tree row seen below. This is an object lesson as to why Infantry are at such a disadvantage to Airpower. Three deer running in circles. A few minutes later I saw another group. This one was making a beeline for the small forest Northwest of my position. You can see my shadow at the center left of the picture. The Morning Memo For Deer that day was to travel in threes. I glanced over my left shoulder back toward the sun and saw this house on a ridge. The low hanging fog gives the shot nice depth. I’m at 200′ AGL looking East Southeast. 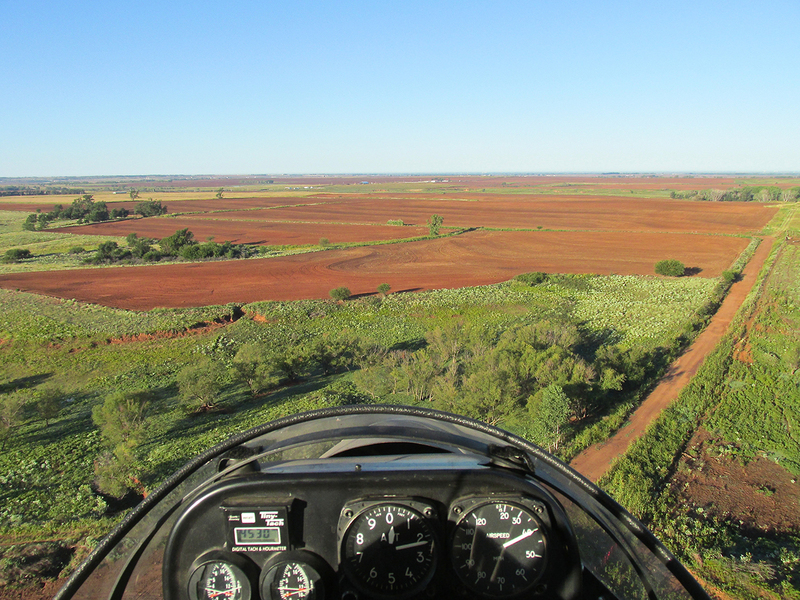 Miles of Red Dirt! You don’t need a GPS to know you are in Oklahoma with this type of prompting. I was at 100′ AGL when I recorded this GlennView. 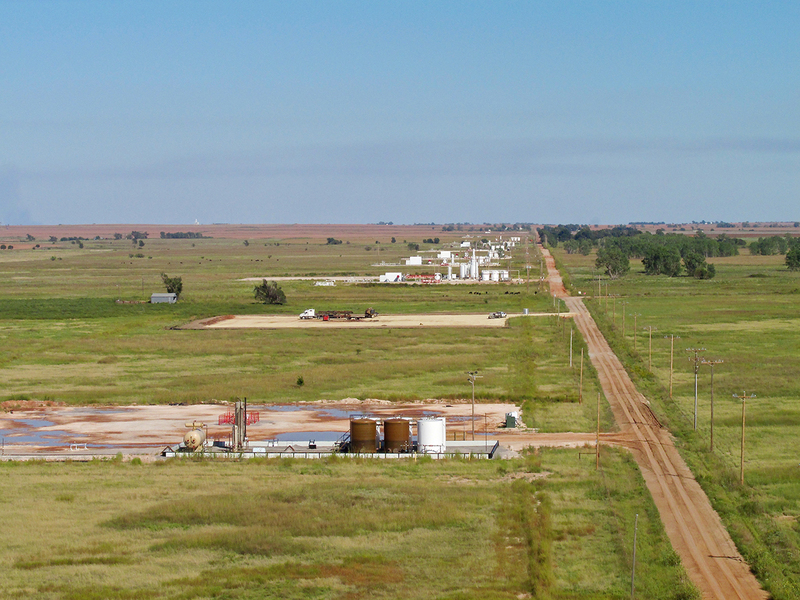 Between Anthony, Kansas and Cherokee, Oklahoma is an area that has seen a dramatic increase in oil exploration over the last five years. 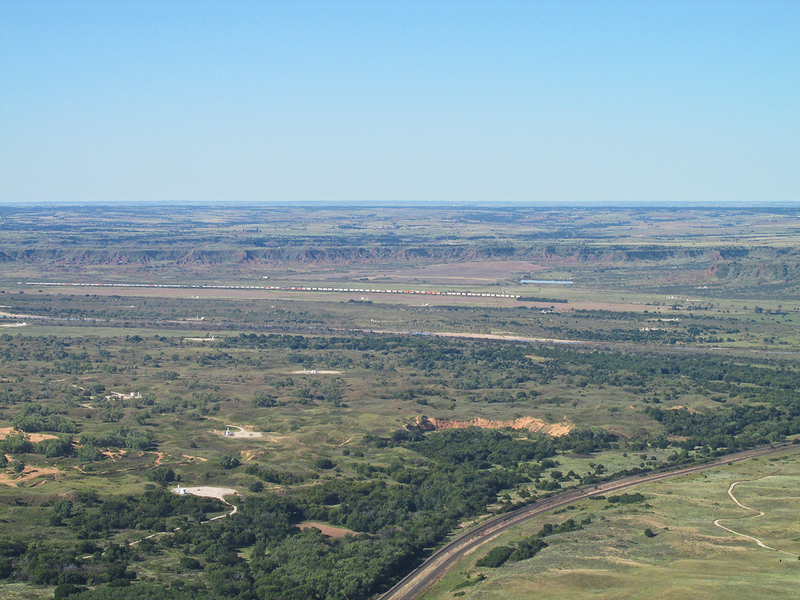 Below is my attempt to give you a panoramic view of part of this area just South of the Kansas / Oklahoma Border as I entered it from the Northeast. 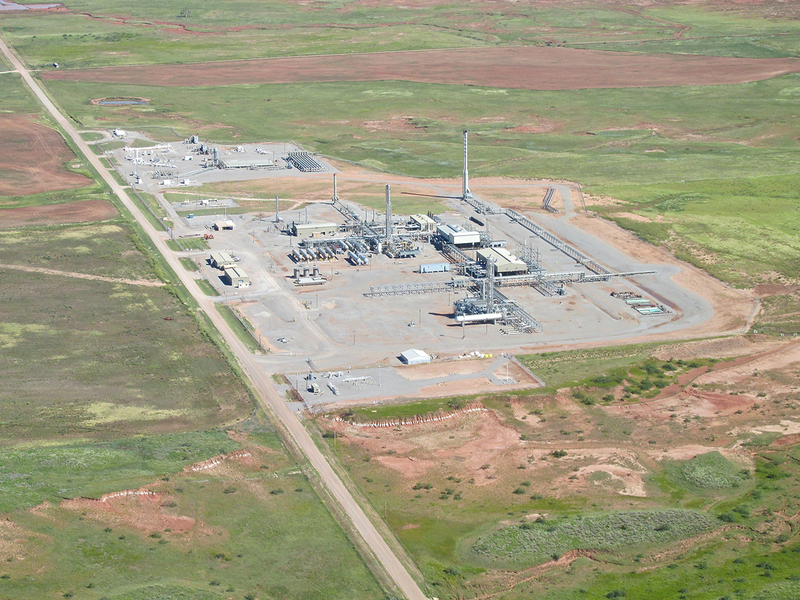 In the foreground and in the distance, any bright white color you see has to do with oil and gas. I will be showing a number of these installations as the flight continues. This next shot is the best I could do to present an amazing situation I had never encountered before. 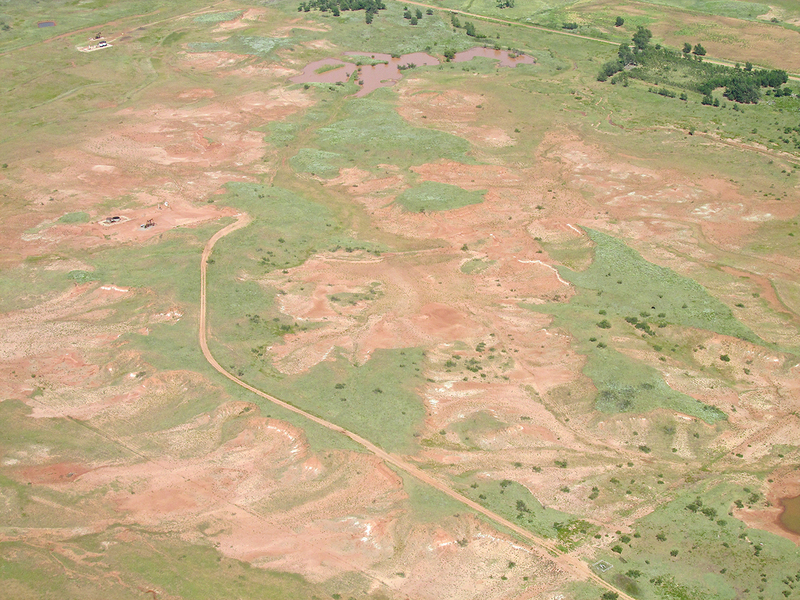 The photo below was of the second field I passed over featuring this phenomena. It took that long to get the camera ready. Here is what I saw… As I first came upon the field, it seemed to be covered with little white flowers. They were attractive but too small and not sufficiently bright to warrant a photo. Then, halfway across the first field, I realized they were not flowers but butterflies! Because of the brightness of the sun they show best in the shadow of my airplane. Then, if you look closely, you can see them equally arrayed over the entire field. I think the crop is alfalfa. 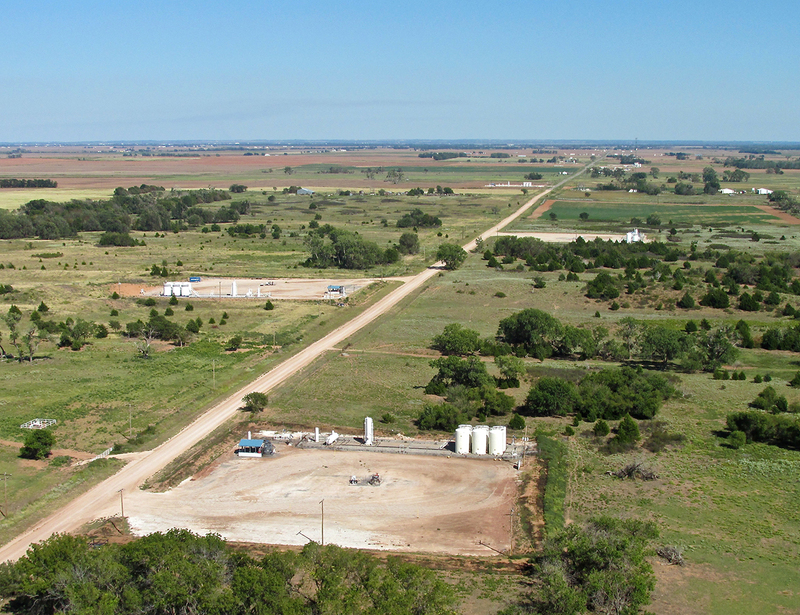 Flaring has become controversial but its opponents mis-state the issue either out of ignorance or a desire to mislead. Environmentalists are suing oil companies for “wasting” gas when they have to flare it. The fact of the matter is that oil companies flare gas only as a last resort. If they made even a casual attempt at understanding the oil and gas business, enviros would realize that petroleum people would love to make money off the gas but sometimes it is not possible. Pipelines are very expensive and cannot be laid without significant return on investment (ROI). 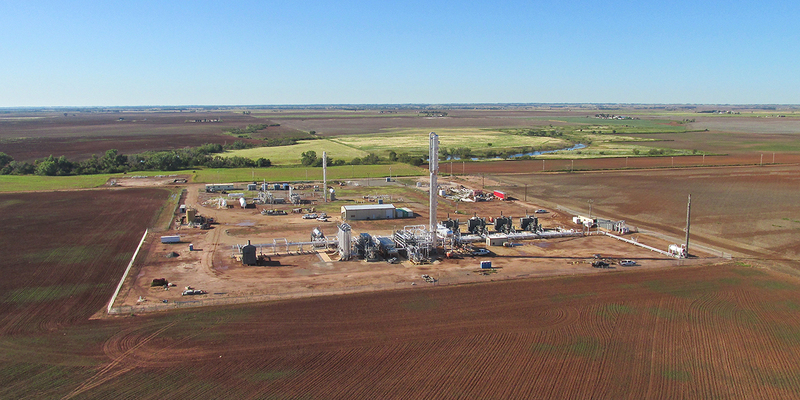 Alternatively, the equipment required to compress gas for storage and then transport it is costly and warranted only over a large discovery where no pipeline can be utilized. The overriding issue for producers is one of safety. When drilling for oil, most of the time gas is present. Obviously it is highly flammable. If allowed to escape into the atmosphere, the results can be disastrous. If gas leaks, fire or explosion is the rule. Flaring at a wellhead is the undesirable but necessary method to protect against catastrophe. This is by far the largest well site flare I have seen in my travels. Note the heat wave distortion over the fire plume. I had been flying over two hours and decided to take a break. My favorite landing fields are (mowed) hay and wheat fields. 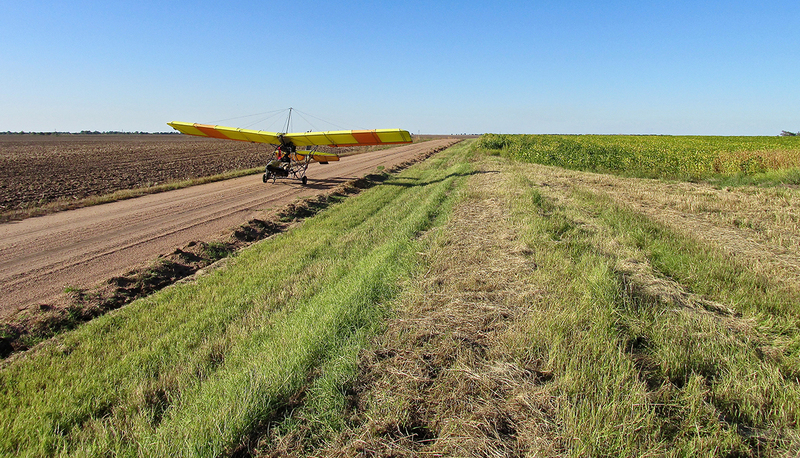 I was about 8 miles from Waynoka, saw this fine open field and put her down. 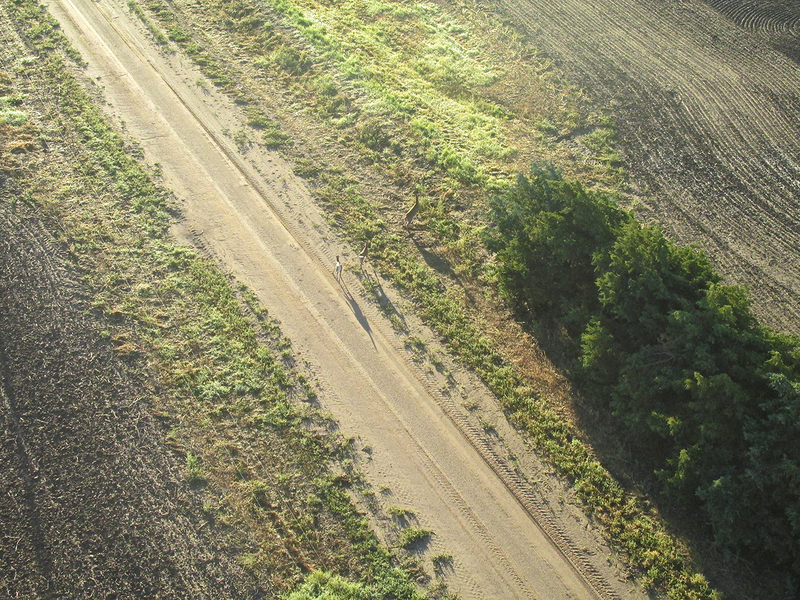 After taking a break (and a couple of “product shots” of my MXL), I checked the paper map to confirm I was only 8 miles from Waynoka – just as the GPS indicated. Suddenly the topography changed to these interesting bluff formations. This area had “Cowboy and Indian Movie” written all over it. 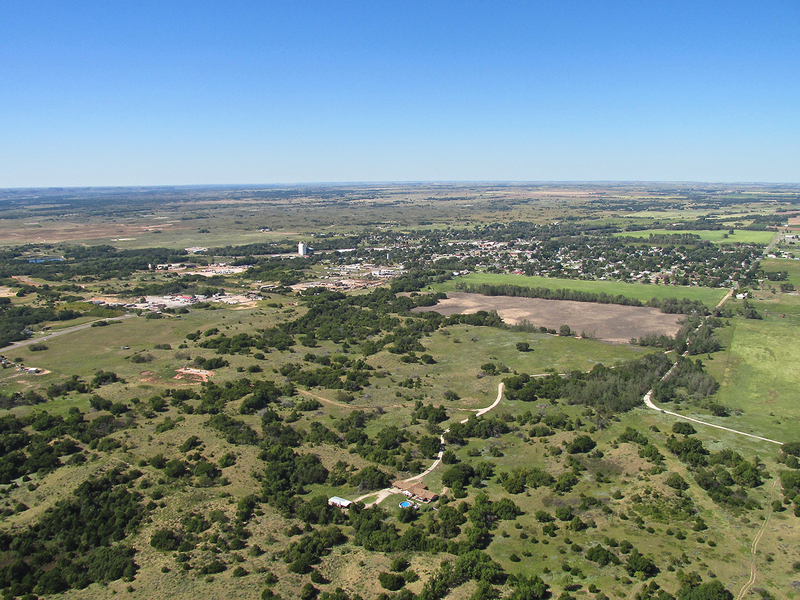 I shot this from about 75′ AGL looking Southwest. Same altitude and angle as above. As I approached I wondered if someone was watching me from the hunting blind. 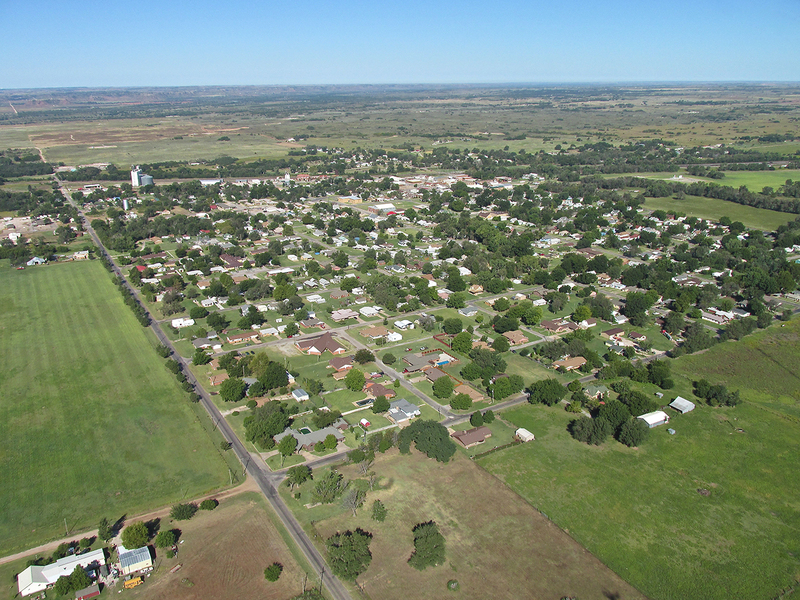 I was flying so low that when I finally came upon Waynoka I could see very little of the town. My SOP (Standard Operating Procedure) when arriving at a new destination is to encircle the town to take photos before landing. One reason I do this is for “safety shooting”. By that I mean I get the aerial shots of the town on arrival in case the weather should turn against me while touring the town. A quick egress would prevent the taking of aerials before striking camp and high-tailing it for home. 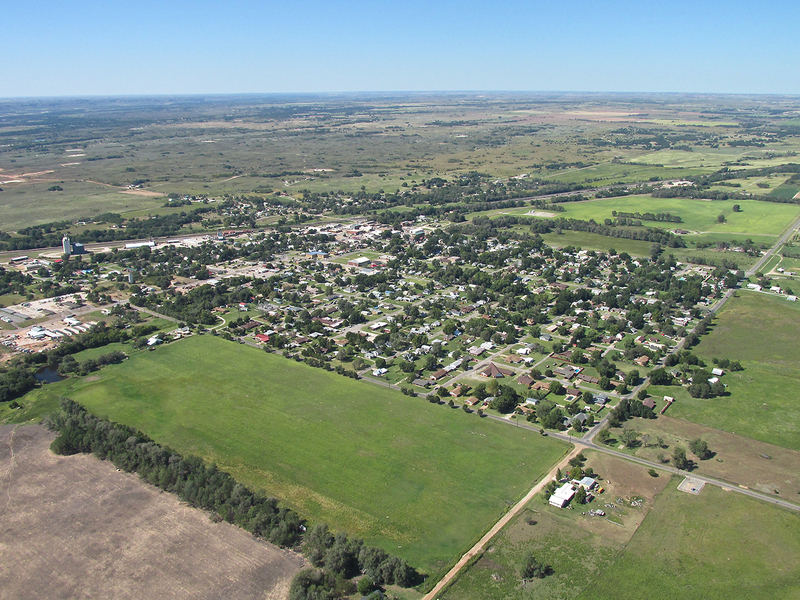 To me, the photo-documentary aspect a flight to visit a new town would be severely lacking bereft of aerial photos of the town in question. So, I always take them when I arrive and then again when I leave. Since I was approaching from the Northeast and the Airport was on the Southeast side of town, best coverage would be obtained by making a counter-clockwise circumnavigation. 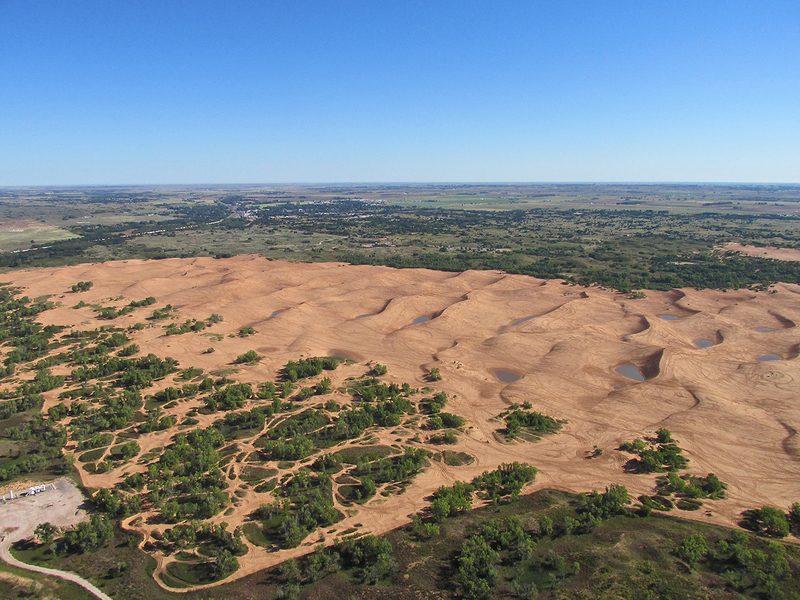 In addition to the aerials of Waynoka, of great importance was to get photos of the Famous Little Sahara Sand Dunes South of town AND “2 shots” of the City and Sahara together. That’s what you will see next. 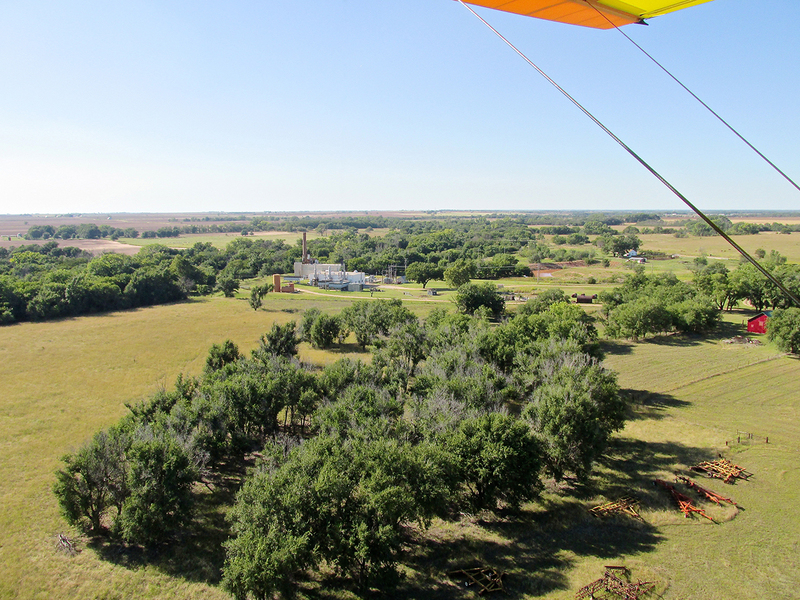 Almost directly North of town, I am only 100′ off the ground. 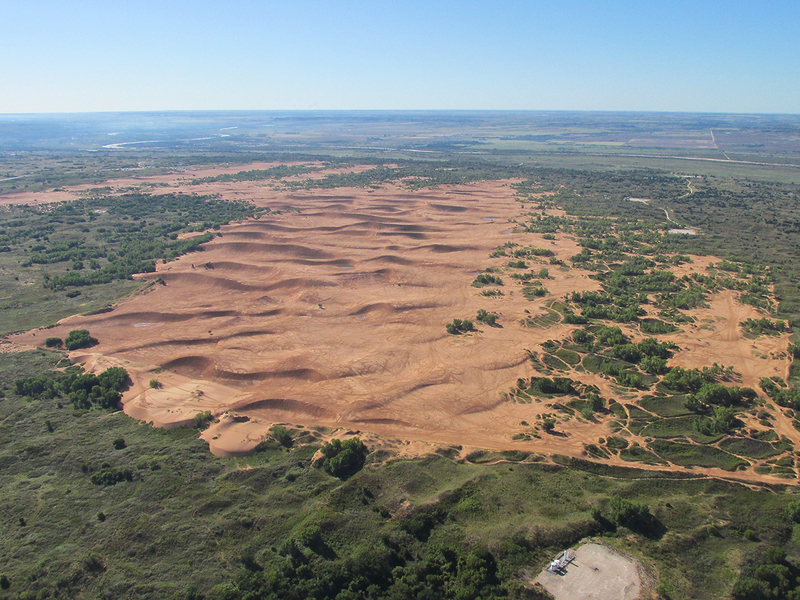 Right after this I “poured on the coal” and climbed to 1,500′ AGL for a better perspective of Waynoka and the Sand Dunes. 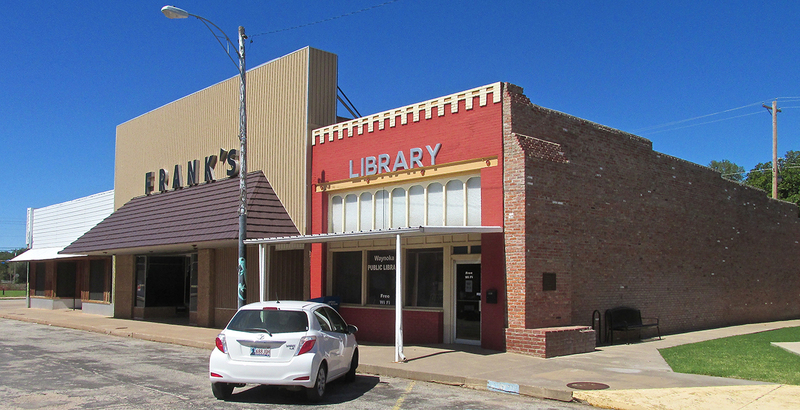 Downtown Waynoka with the BNSF Railroad coursing next to The Harvey House. 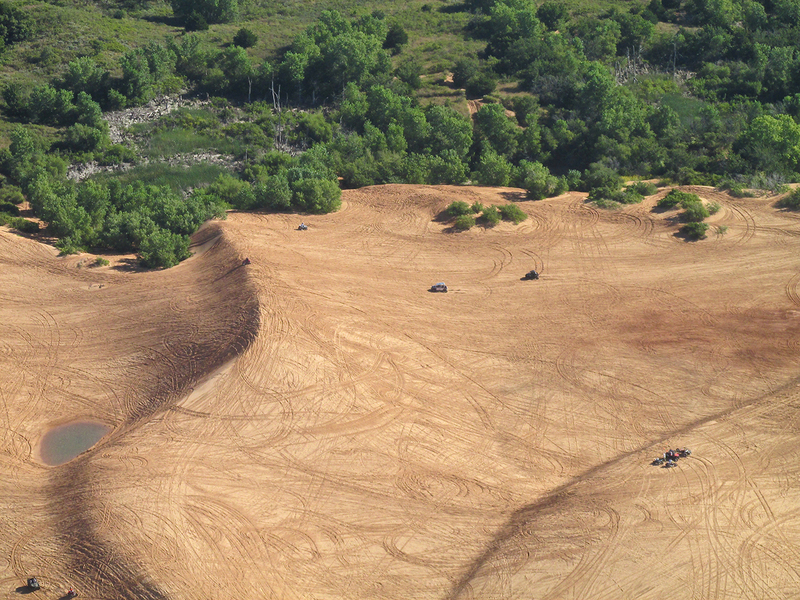 In the background the Sand Dunes are becoming more evident. Halfway through my climb I am at 600′ AGL now. 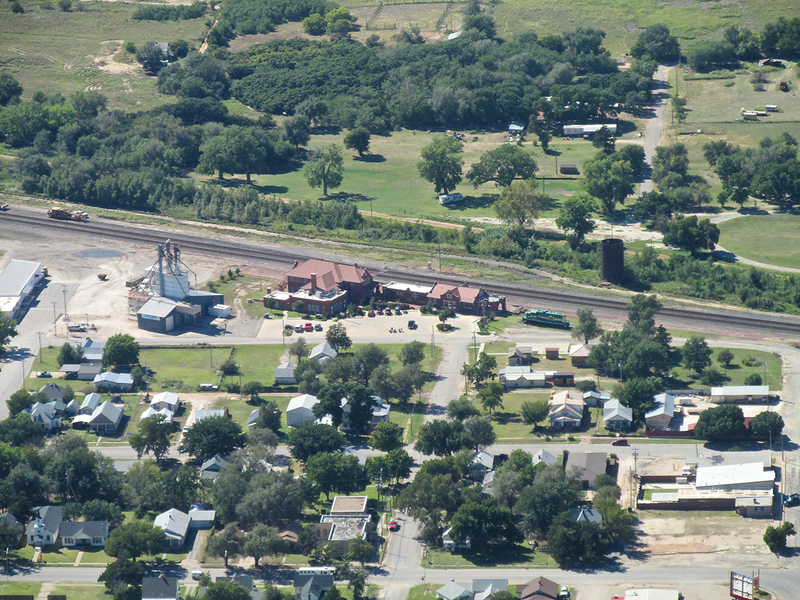 From 800′ AGL as I was passing the West side of Waynoka I took this telephoto shot of The Waynoka Harvey House. Later in the report will be more pictures of it from the ground. While climbing to position for the Little Sahara and “City/Sand” Combo Shots, I was blessed with this grand entry of a long train set against the picturesque bluffs West of Waynoka. The next order of affairs was to get a complete “East to West” panoramic of Little Sahara. this is from 1,500′ AGL looking South. 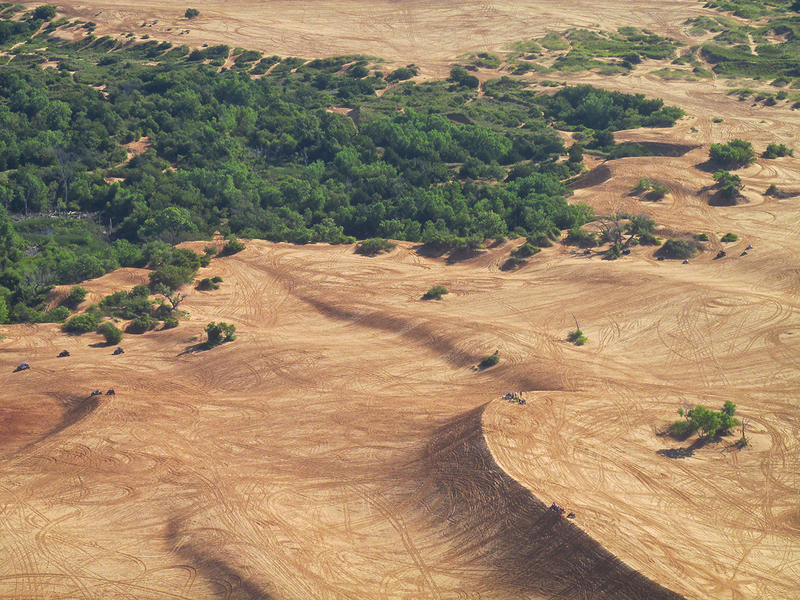 Telephoto of Little Sahara from 1,200′ AGL looking Southeast. 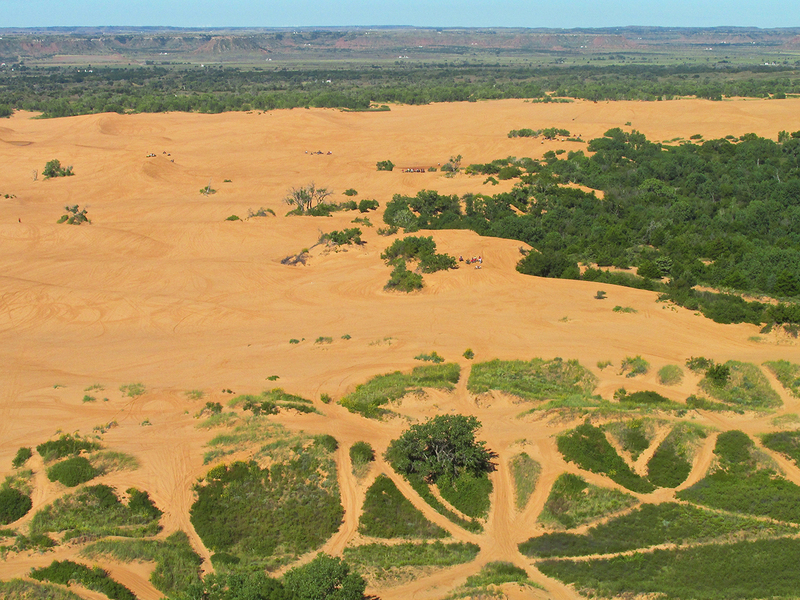 Note the Cimarron River South of the dunes. I have now come around to the South. 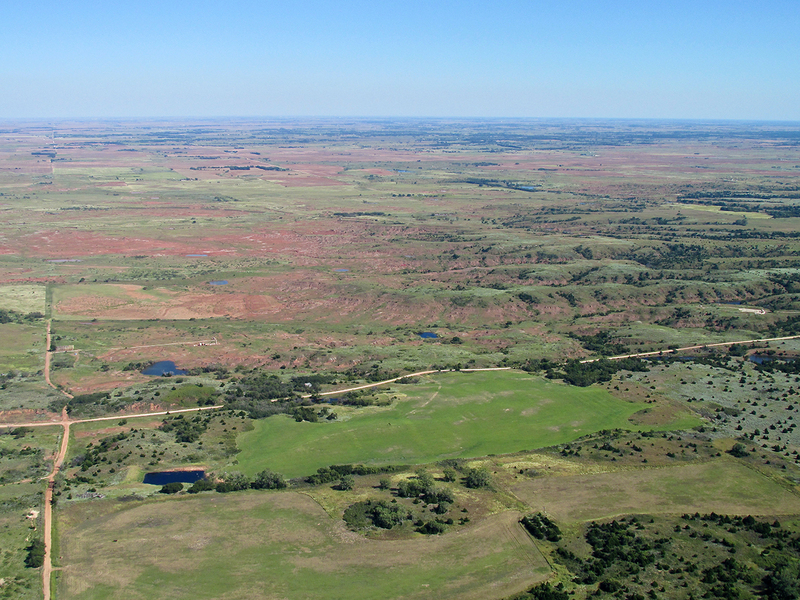 This is from 1,000′ AGL looking North with part of Little Sahara in the foreground and Waynoka in the distance. Note the train that was photographed earlier now passing by the Harvey House. 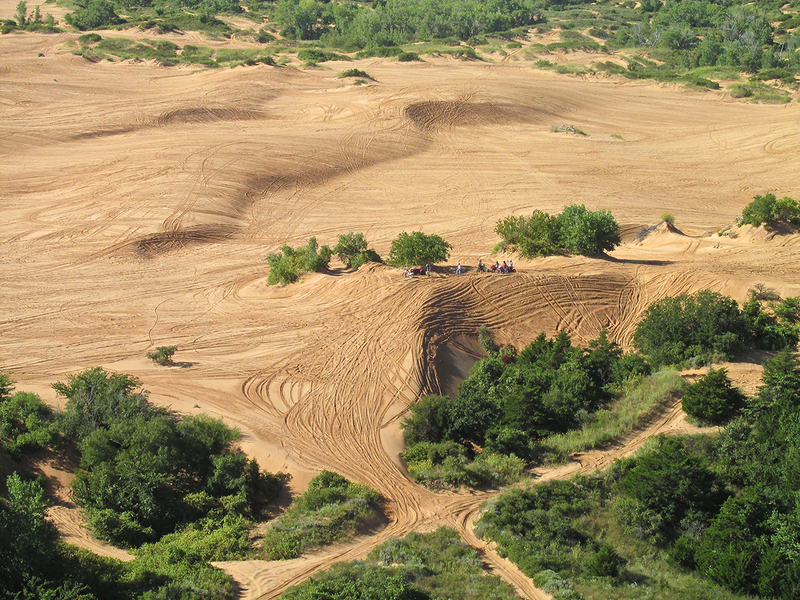 There were loads of 4-wheelers and motorcycles coursing in all directions across the dunes that morning. When I was a teen, dune buggies were converted Volkswagens. While there are still some of that type around, the field has widened considerably. Some of the 4-wheelers are built ground-up for this purpose. Others are sold ready-to-ride. I shot this series of telephoto pix from 1,000′ AGL. Here you can see some of the huge rigs people use to bring their dune riders to Little Sahara. I was very impressed with all the action of the scene below me and still had some fuel left so I dropped down to 500′ AGL to make some passes across the North Side of the dunes. 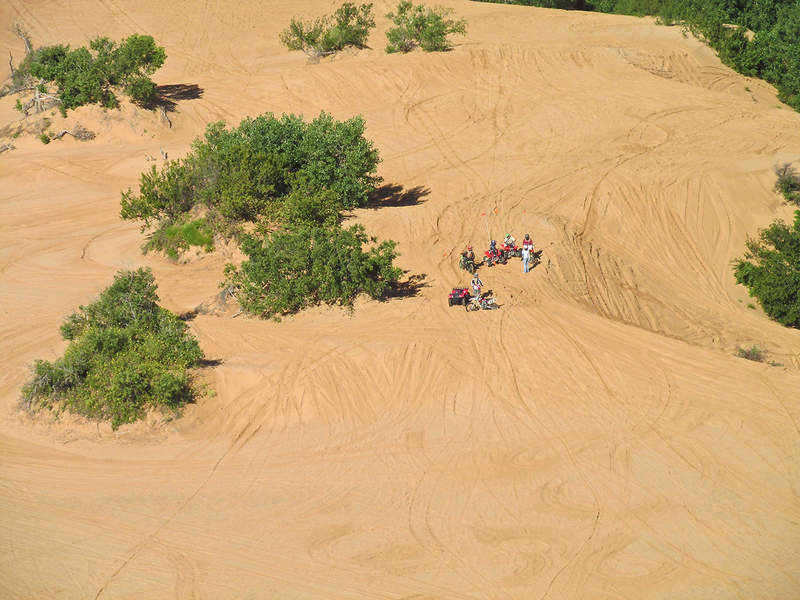 People seem to travel the dunes in little groups. It looked to me like they have favorite places they show each other. When they get to these spots they try jumping or climbing the obstacle. 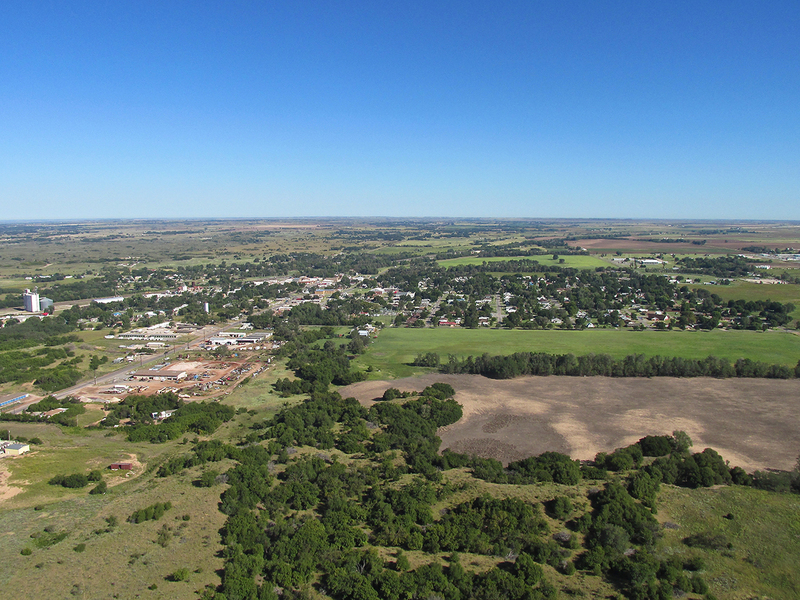 I had spent about 20 minutes flying over the dunes and it was time to get a look at Waynoka. Wind was starting to build from the South. 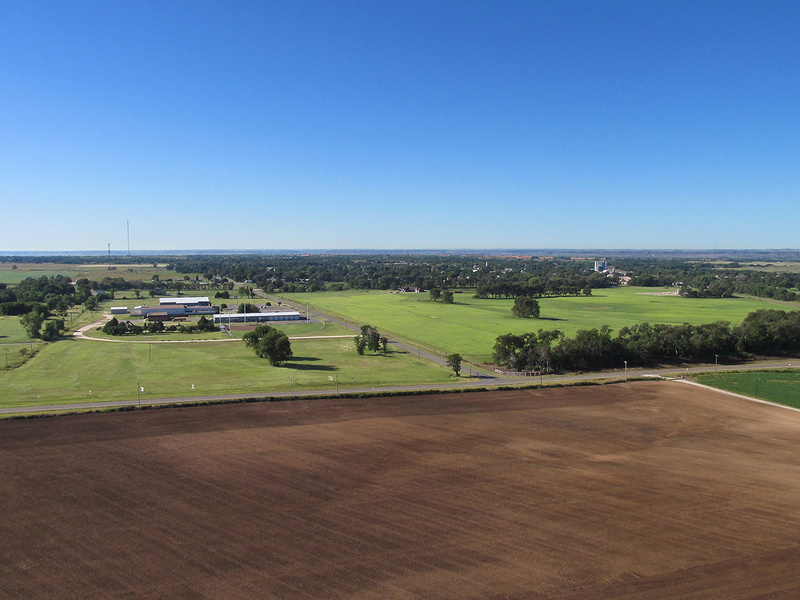 I set up for a right hand pattern to land at Waynoka Municipal. 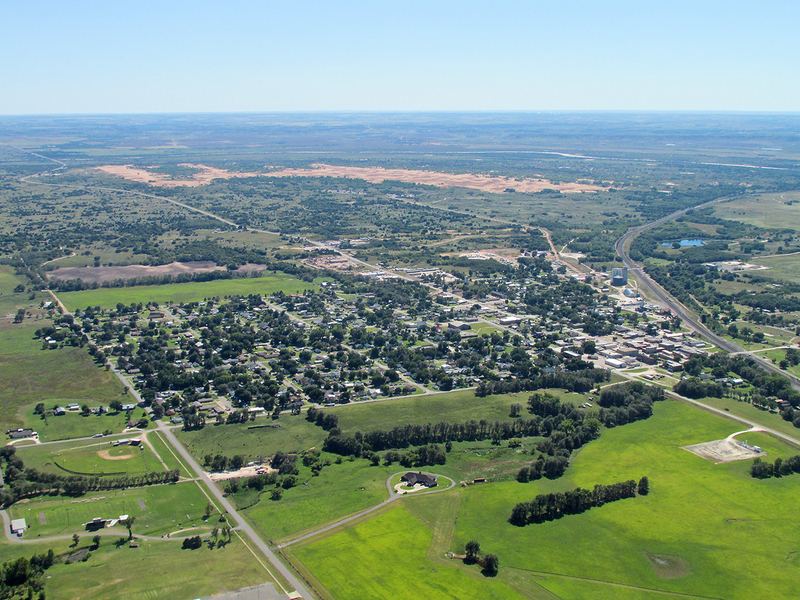 Before entering the pattern to land at the airport, I grabbed this shot of Waynoka from the South at 800′ AGL. After roll out I snapped this shot of the terminal building and courtesy car. While I was tying my MXL down, a car arrived. The driver was Sue Hughes. The passenger was Murphy The Dog. Sue and her husband Dale are recent immigrants from Denver, Colorado. 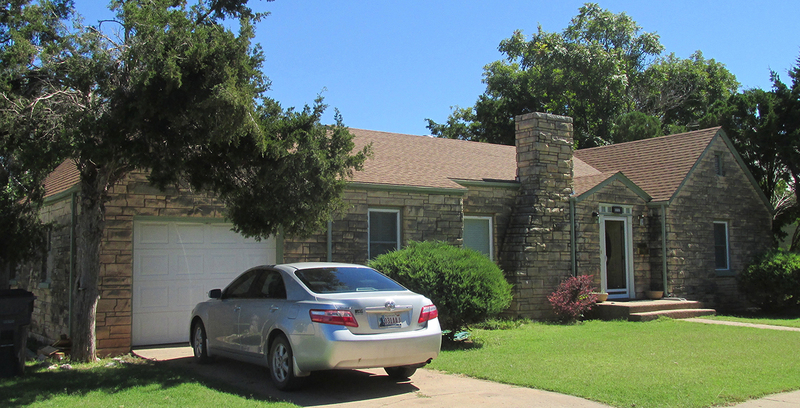 They desired the benefits of “small town life” and had moved to Waynoka six months prior. A consistent theme I see in the small towns I visit is the large extent to which citizens contribute their time and effort to various public service committees. Dale and Sue have an interest in aviation (they own a 1981 “T-Tail” Piper Arrow) so upon moving there they joined Waynoka’s Airport Advisory Committee. The morning I met them they were hard at the Committee Work of keeping the runway free of intruding plants and weeds. 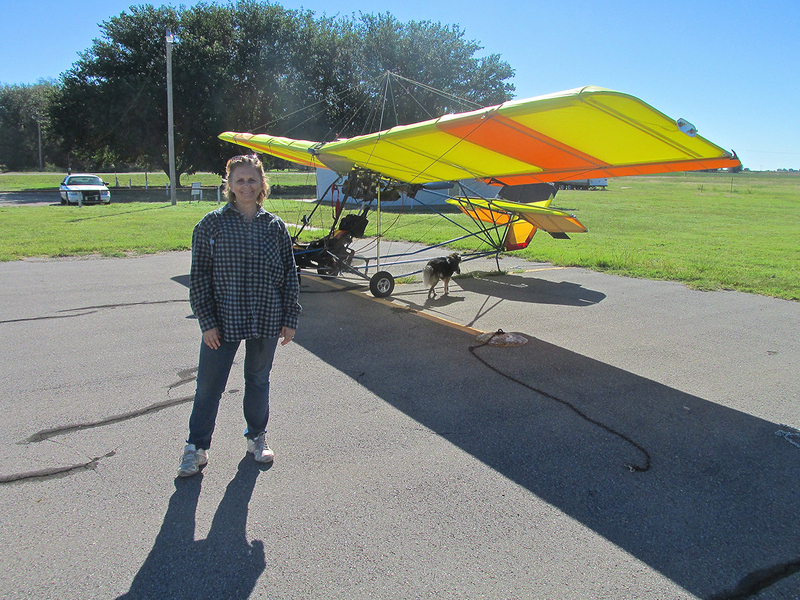 Sue has a business oriented toward women pilots and female aviation aficionados called Powder Puff Pilot. It features lots of av-equipment, apparel and educational items – many would make excellent Christmas, Birthday or Anytime Gifts. Check out her website HERE. Five minutes after Sue went back to her chores, husband Dale showed up to ask if I needed anything. They were working on opposite ends of the field. Dale is Sales Manager for Brance-Krachy which is a company in Aurora, Colorado involved in power transmission supplies and service. In answer to his question I told him the battery in the Courtesy Car seemed to be low but I had already called the dispatcher and help was on the way. He said, “Good deal. Nice to meet you. I have to get back to work now. 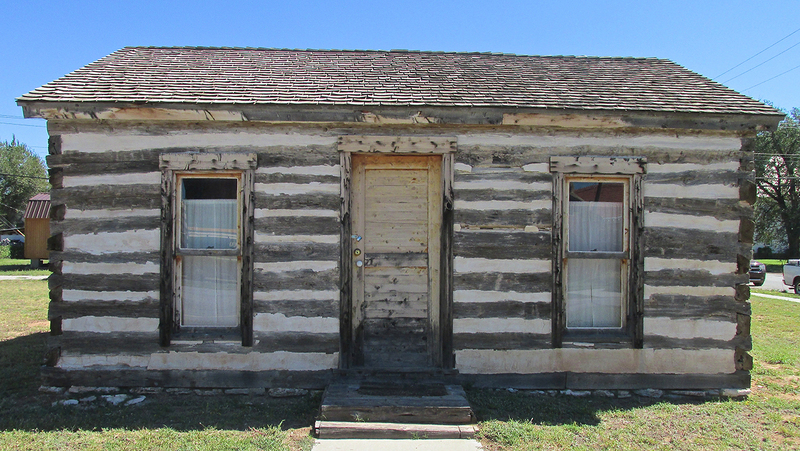 Have a nice time in Waynoka.” Then he said Goodbye and returned to his work. After getting my plane secured I entered the terminal rest room to remove the long underwear I had employed to take the edge off the early morning chill. Then I loaded my stuff into the Courtesy Car and turned the key. All the lights on the dash came up, the fuel pump whirred and the radio came on but the engine would not turn. Because it was a decommissioned police patrol car it had some unique buttons about the console. I tried every one I could to see if they were some type of ignition lock but finally decided the battery just didn’t have enough amps to turn the motor. I called the telephone number given in the airport lounge and the county dispatcher said help would arrive soon. Bein’s how the Courtesy Car was a retired patrol car, it seemed fitting that two Waynoka Patrolmen came to give me a jump. 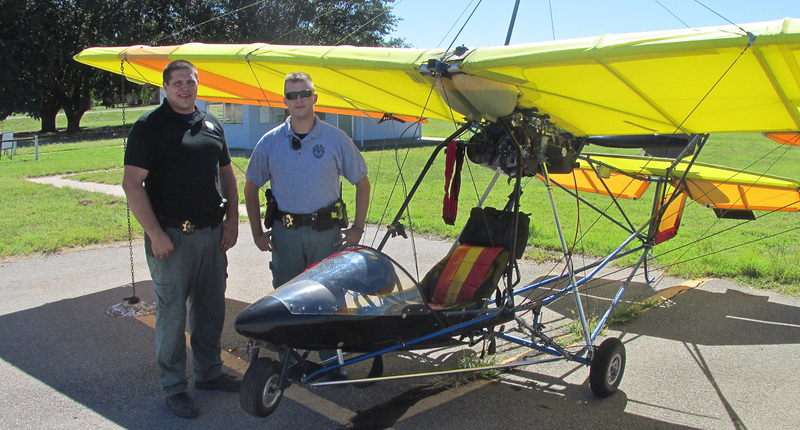 This situation was fortuitous for them also, as both had been intrigued for years with Ultralight Flying but had not had a chance to see one up close. After starting the car I gave them an in-depth walk around of the Quicksilver and a good discussion of the merits and issues of this type of Sport Flying. After thanking Fike and Marcum, they went back on patrol and I headed into town for some gas. I’m big on prioritizing. Priority One was to transport gas back to the airplane before exploring the town. As I left the gas station I saw this radical sand machine round the turn in my rear view mirror. I quickly pulled over while lowering my window and firing up my camera. Good thing I hurried because he made a microsecond stop at the stop sign and headed away. That was the moment I grabbed above. A couple of minutes later a duo of 4 wheelers came bounding around another turn (the tire of the second one is just visible behind the shack to the right). Here the two of them head back to The Dunes. This is one of the designated paths for the Dune Riders to get in and out of town so they don’t mix with regular vehicular traffic. 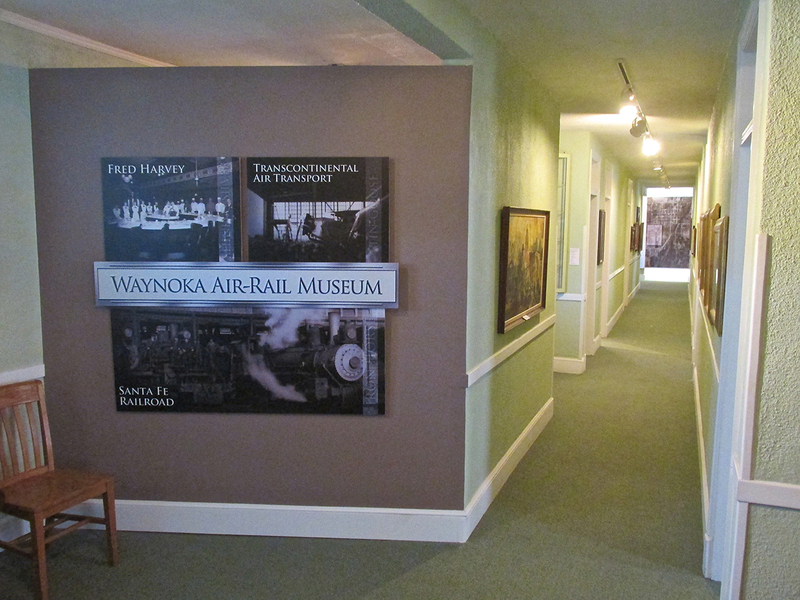 While researching before my flight I discovered The Waynoka Historical Society. 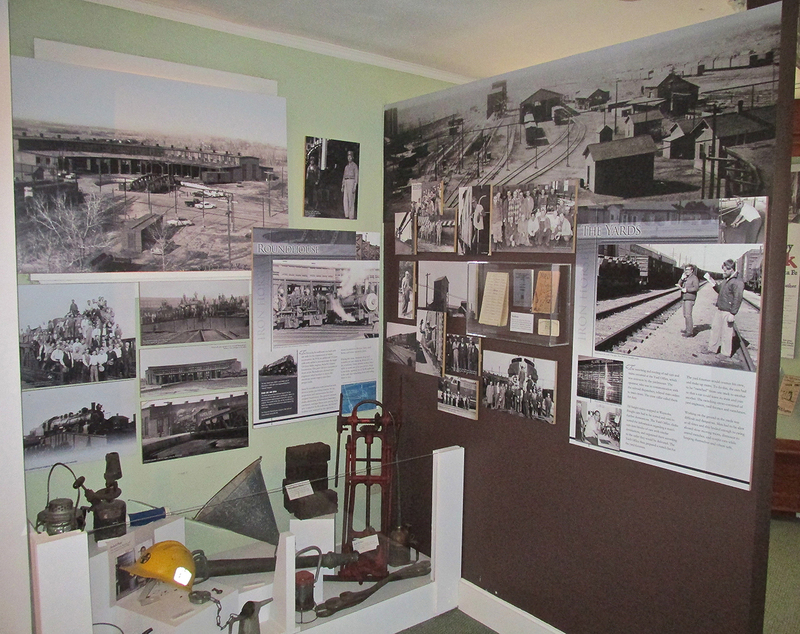 They are a dedicated and active group devoted to preserving the history of their town. For such a small town they have accomplished much. 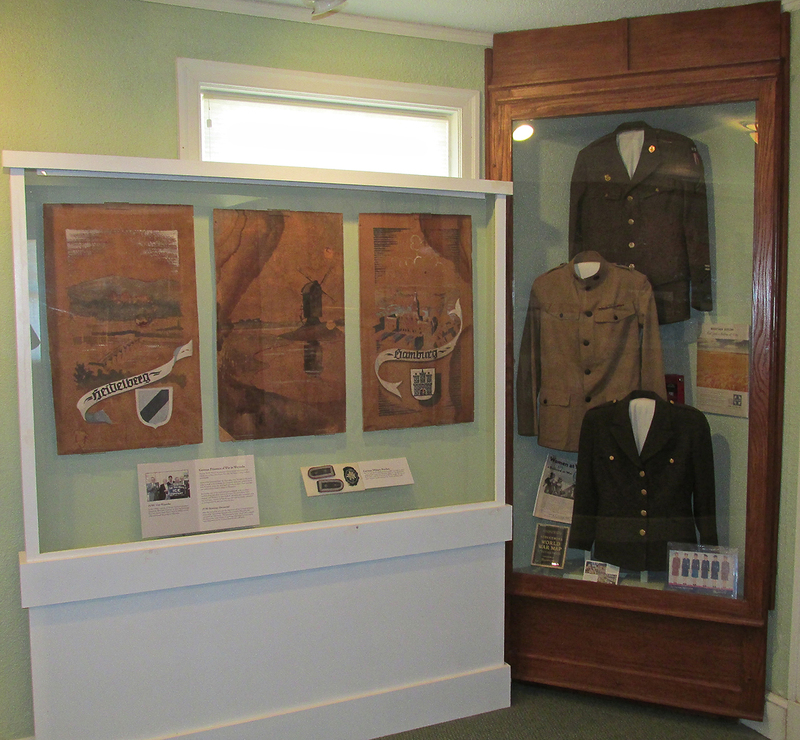 They have done a splendid job renovating The Harvey House and have also moved historic buildings and railroad items into a convenient outdoor display adjacent to The House. This next series will show you some of these things. 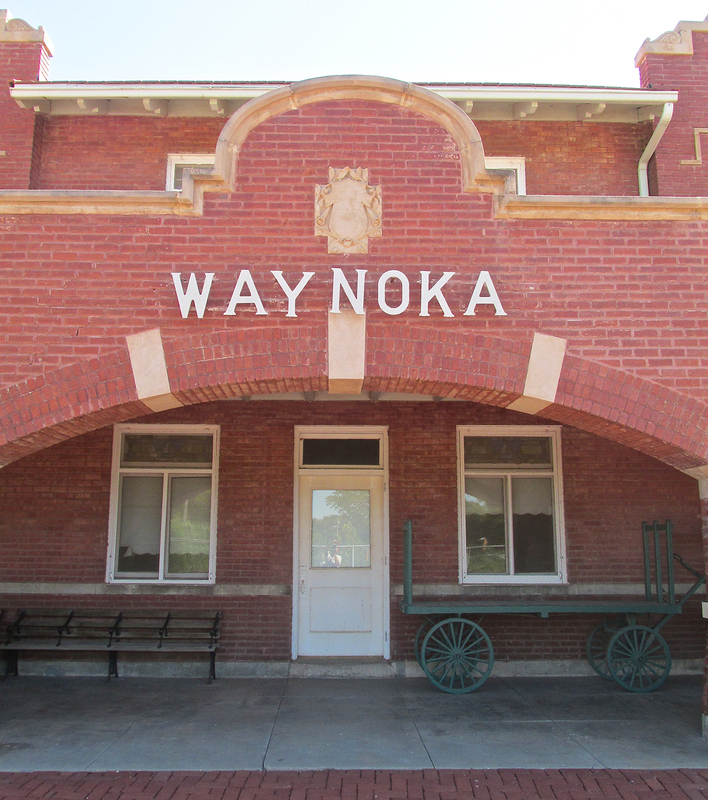 Waynoka played an important part of an early 20th Century effort to combine air and rail transport enabling a coast-to-coast trip in 48 hours. 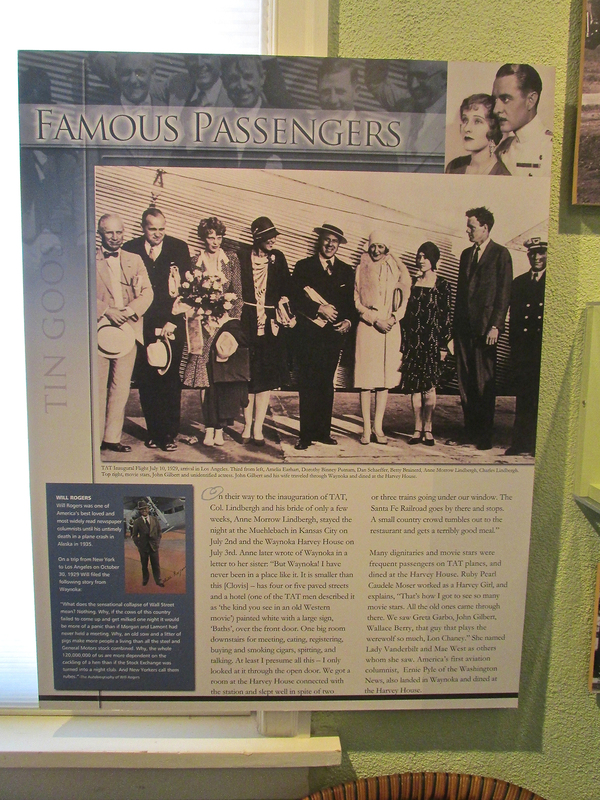 The Lone Eagle – Charles Lindbergh – was a member of The Board of Directors. It was he that planned the route. You can read more about TAT HERE. During my research I also found the definitive Lindbergh website. You can see it HERE. 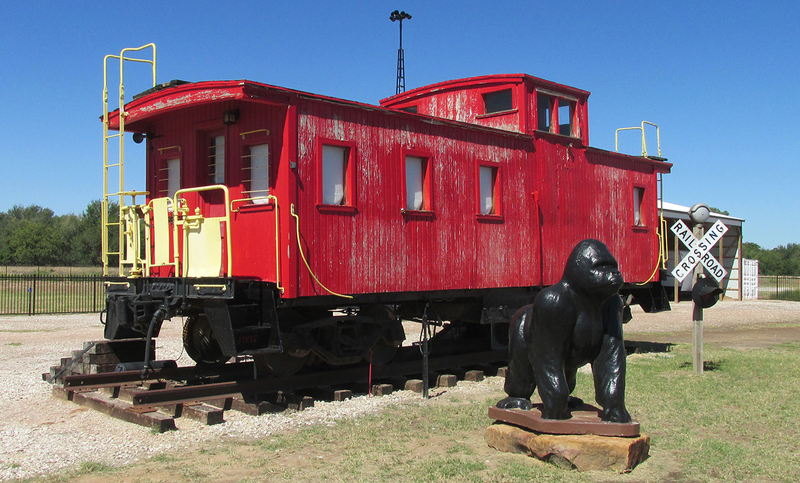 This caboose and gorilla are positioned to the North of The Harvey House. 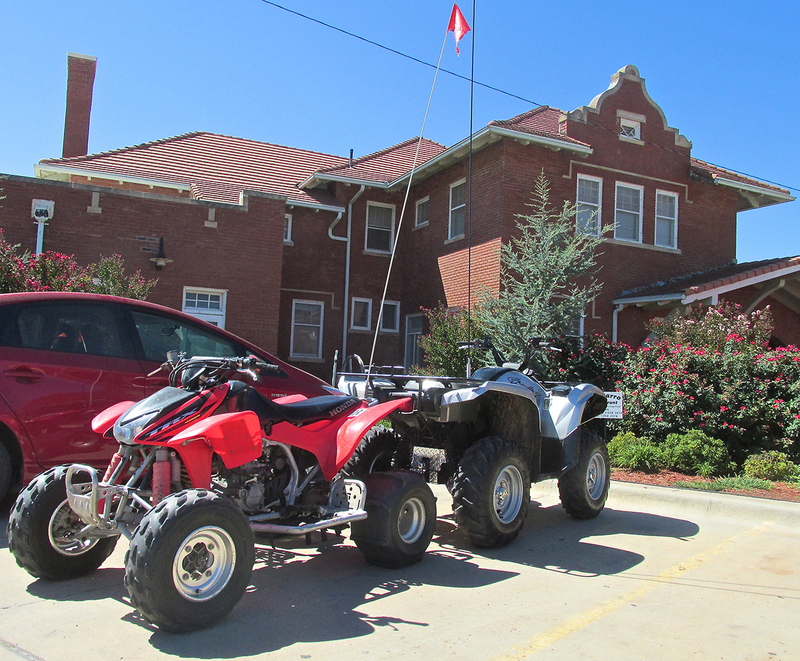 They are not property of the Historical Society but are owned by Dune Enthusiasts who visit the area frequently. Across from the caboose is this interesting series of old houses. 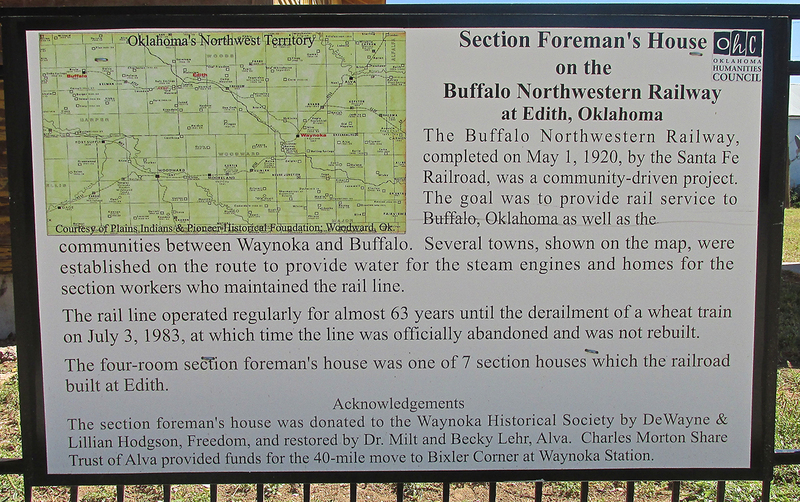 I took pictures of the expositional signs in front of them so you can read about them. The Sky Surfer’s Air Adventures are “slices of time”. So, what you see is what he saw the day he was there. 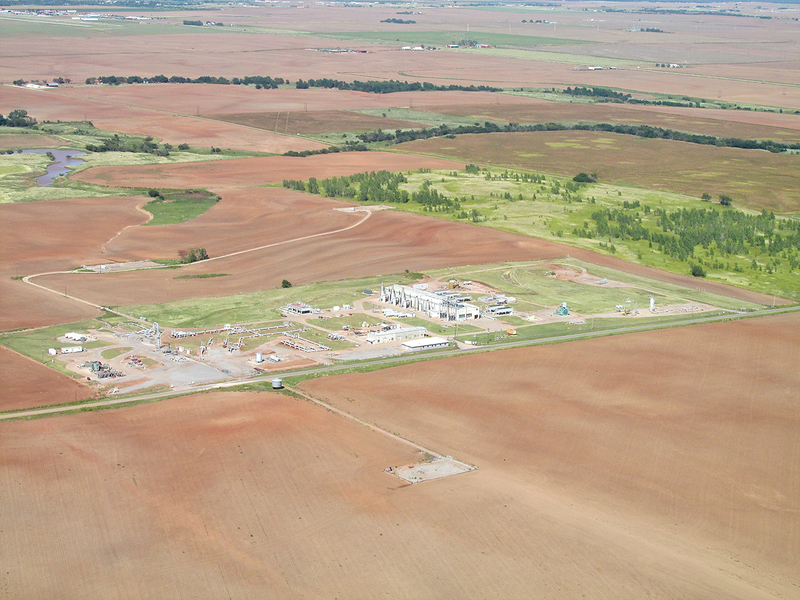 It is important to point out that the two buildings photographed below are in the midst of a renovation being funded and staffed by Chesapeake Energy. Thus far in the project they have power-washed, scraped and applied the first coat of primer. Another coat of primer will be applied before the final painting is completed. 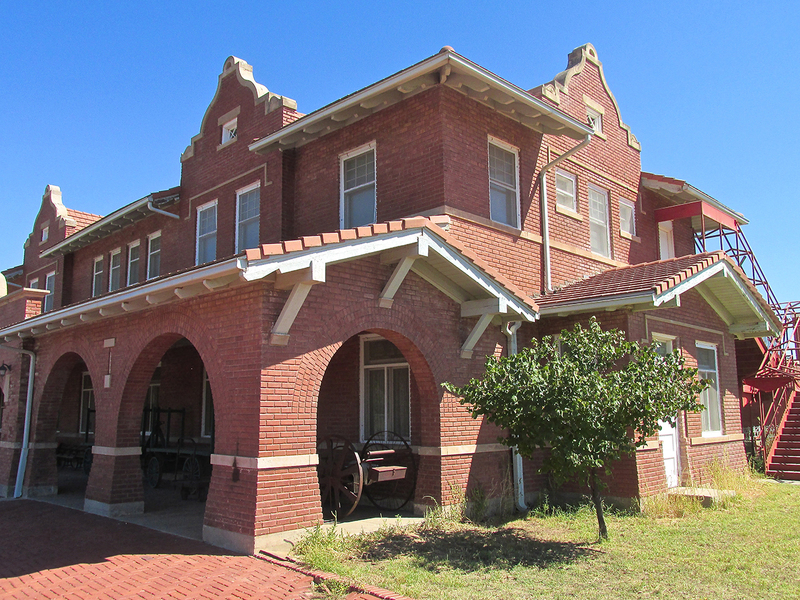 Chesapeake has been of great help to The Waynoka Historical Society in the renovation of these buildings and for the expert landscaping of the Santa Fe Depot and The Harvey House. 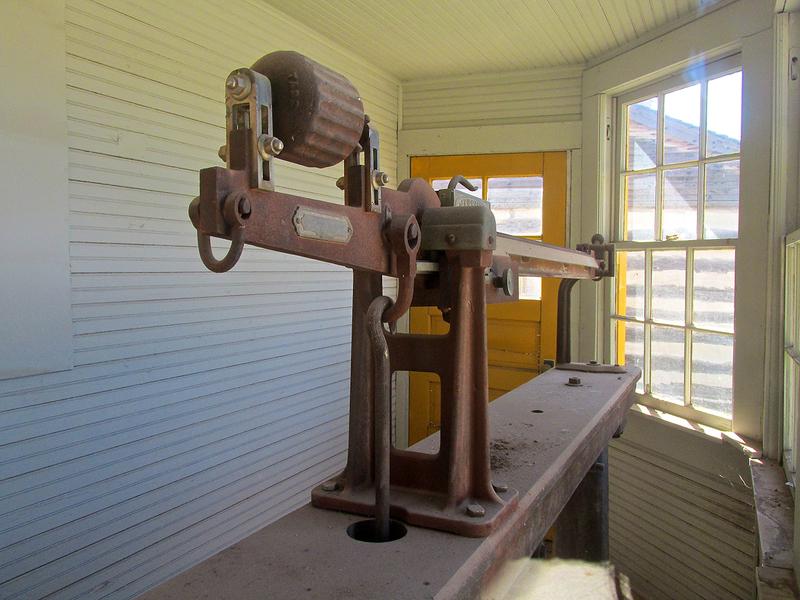 The actual scale is on display inside The Scale House. Not ones to rest on their laurels, The Society is moving ahead with plans for the locomotive shown below, finishing the Train Depot Interior and painting The Water Tower. 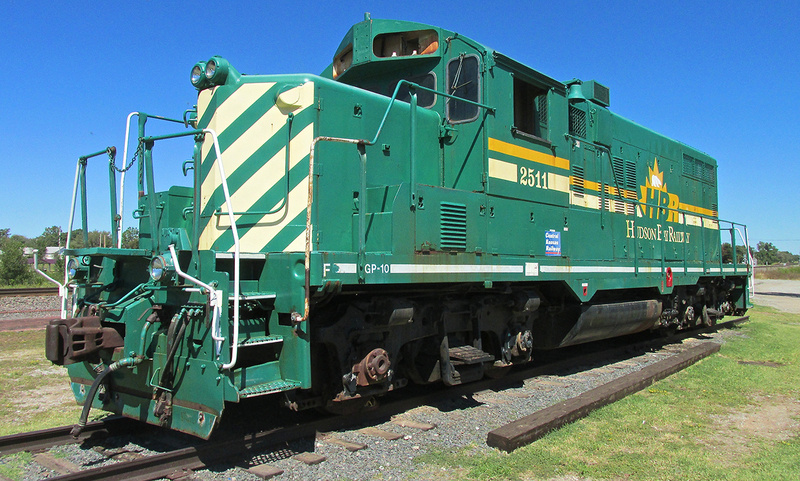 The Locomotive below is slated to be painted in the Santa Fe Warbonnet Paint Scheme in the near future (Warbonnet Paint photos can be seen HERE). The “cornerstone” of the railroad display is the elegant brick and stone Santa Fe Train Station. Soon the inside will house more artifacts in addition to the museum already built on the second story of The Harvey House. 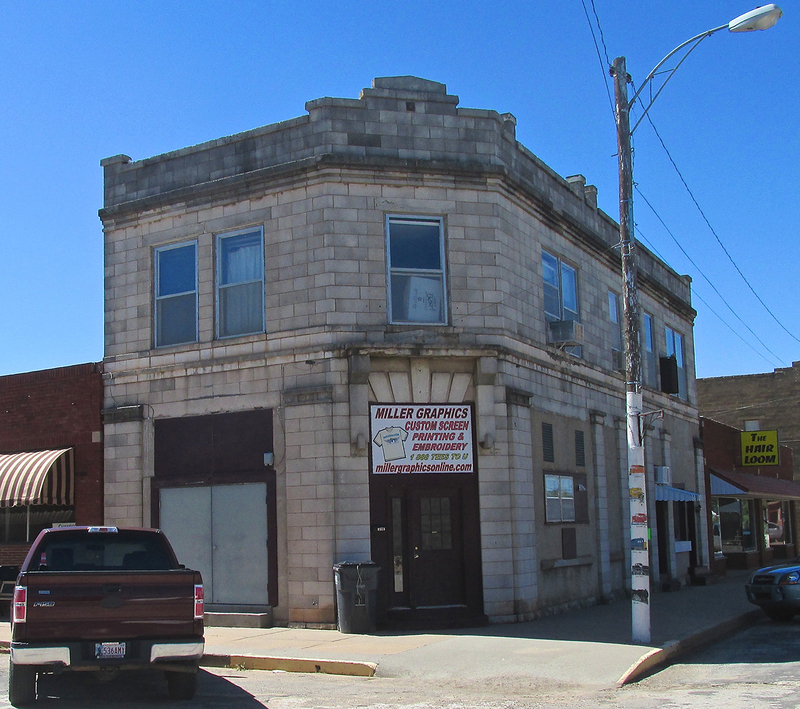 Earlier in the report you saw the aerial photo of this fine building made during my initial pass around the town. 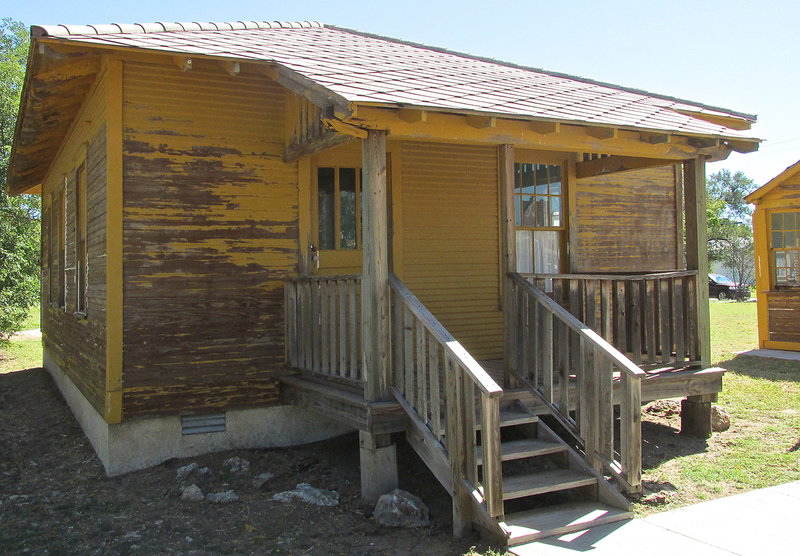 An ediface of The Fred Harvey Company, the Harvey House aspiration was “to bring civilization to the wild west”. 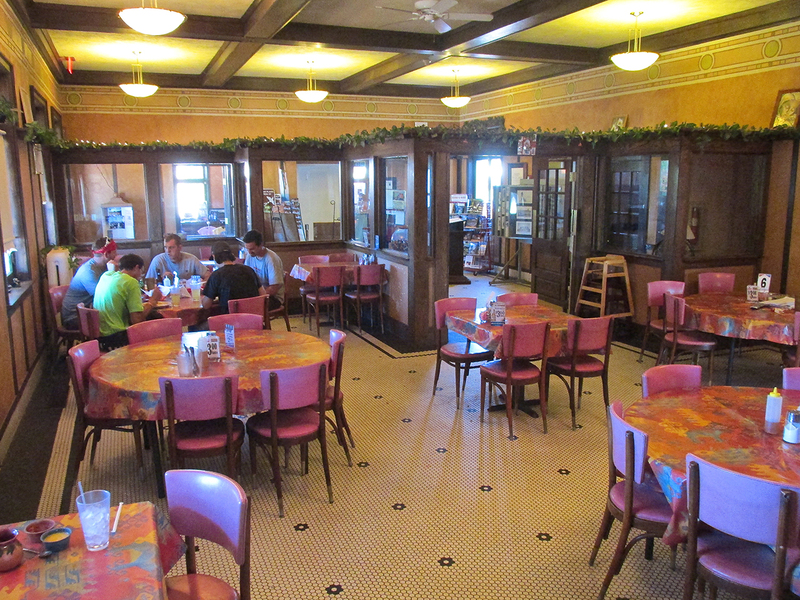 Good food at reasonable prices was served by highly trained, polite staff in elegant surroundings. At the company’s zenith, there were 84 Harvey Houses in the country. More about Harvey Houses HERE. 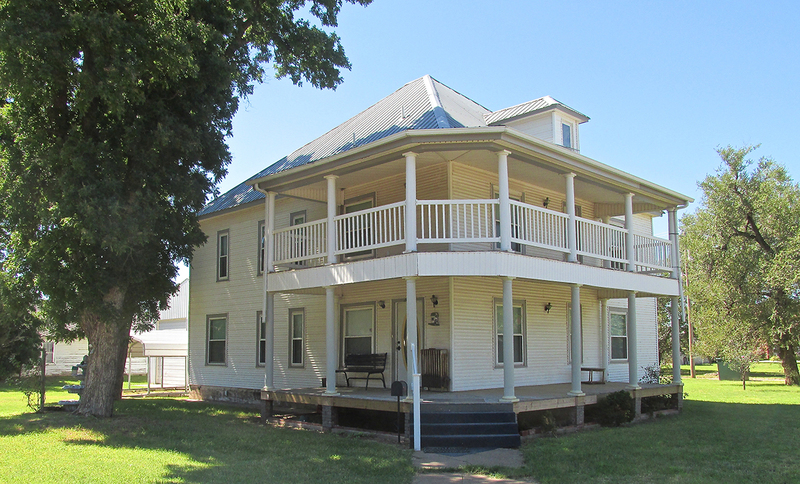 The Harvey House as seen from the Southwest. The restoration of this fine edifice was completed in 2000. The entrance on the West side parallels the railroad track. It is through this the train passengers would traverse. 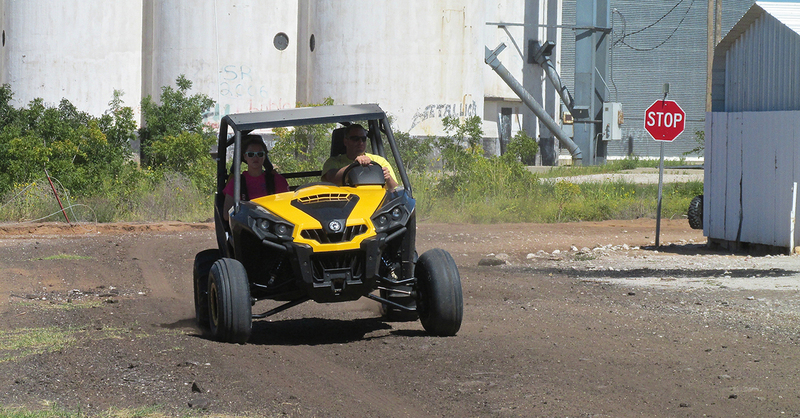 The parking lot on the Northeast side often contains Dune Buggies in all sizes and configurations. 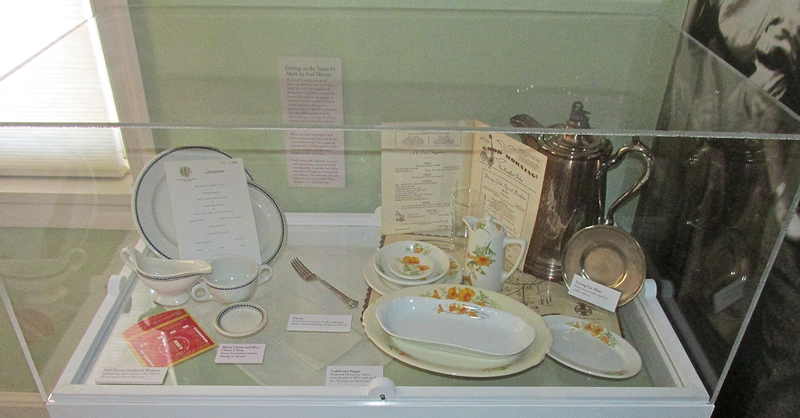 My intention was to tour Waynoka first and then return to The Harvey House for a bite to eat and a look at the museum. 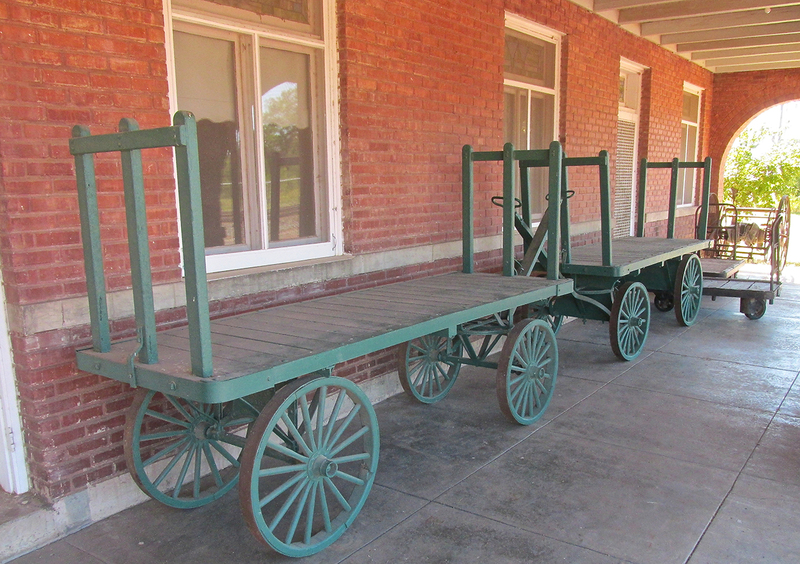 So now I will show you what caught my eye around Waynoka. Stone buildings always get my vote. I like the colors of this place. Wind chimes always work for me. I am partial to brick and stone homes. One reason is that they are becoming increasingly rare. Another reason is my memory of The Three Little Pigs. The brick house was the strong house. 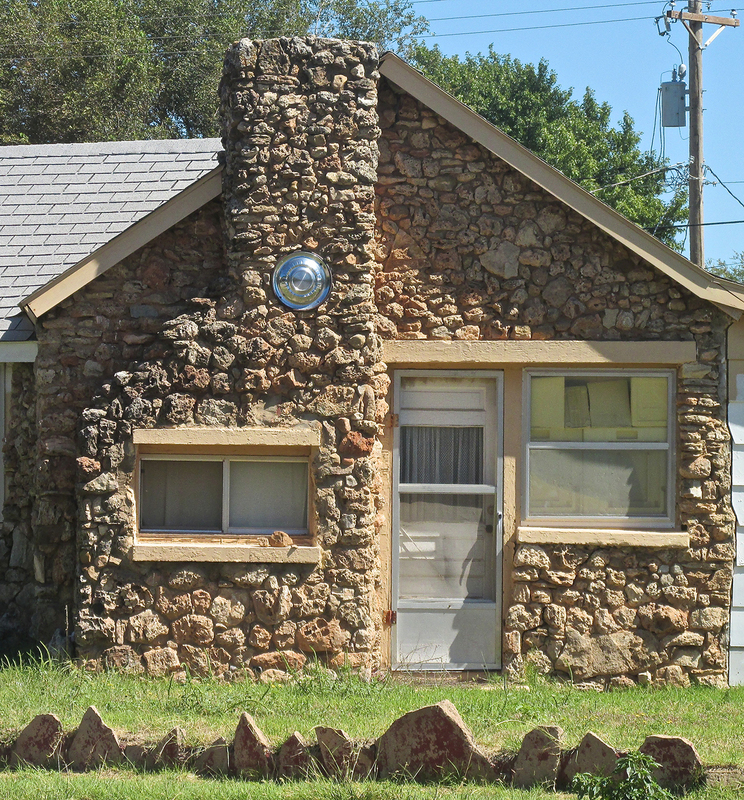 The next picture was the first brick home on this street to catch my attention. Then I looked across the street and saw the largest private dwelling solar cell array I have ever seen. If you haven’t figured this out yet, I’m not the bashful type, so I knocked on the door to talk to the owner about it. Jim Parks emerged and was quite happy to discuss his solar device. He told me he bought it around 2000, it had been dependable and it would power his whole house – while the sun was shining. 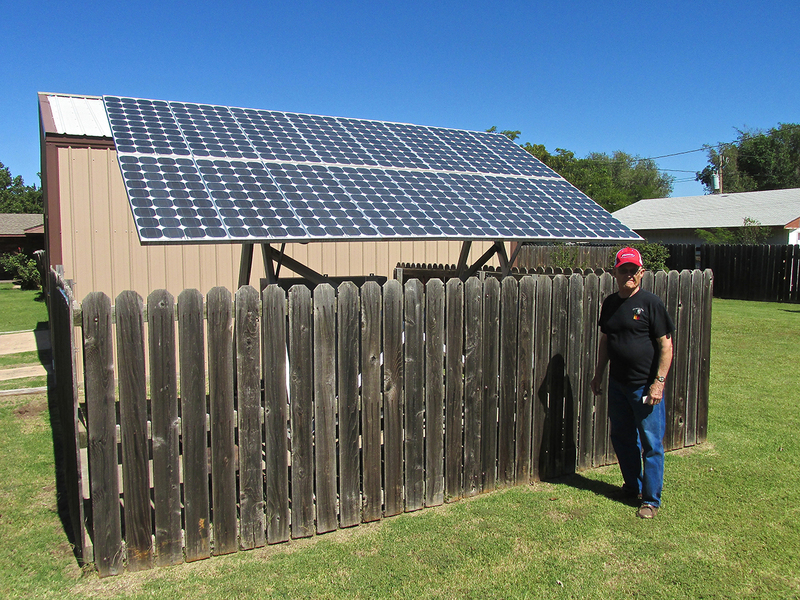 After all those years of operation, he was enduring the recent failure of the switch that automatically takes the house from solar power to grid power. Jim said the manufacturer was wanting more money than he was willing to pay so he was in negotiation mode while at the same time looking for an alternative vendor. Jim had retired from the Hardware Store Business. He was born in Waynoka in 1925 and Served in the Navy’s Submarine Force in World War II. I also found that he is active in The Historical Society. He informed me that a considerable amount of money had gone into the Museum. I told him I was looking forward to seeing it and I was heading there after looking around town. There are some interesting buildings downtown. It is apparent that a number of businesses are catering to The Little Sahara Crowd. Waynokans appreciate The Sand Duners who visit there. 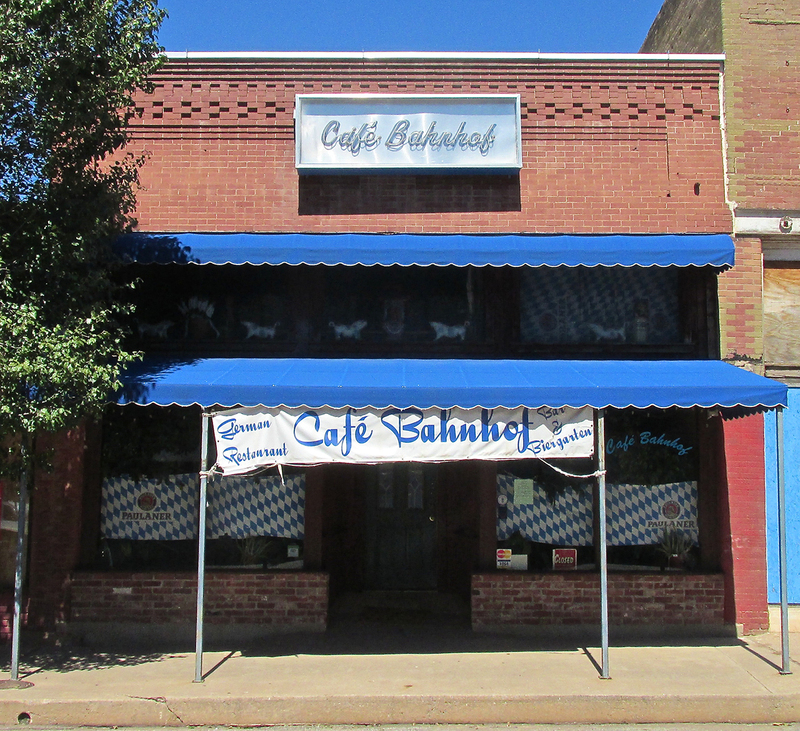 Café Bahnhof was not open that morning but I was told it is quite good and that people will drive considerable distances to eat there. City Hall is a good looking brick building. I had to shoot it from the side because of the large trees in front of it. It was about 1pm and I had not eaten all day. I headed back over to eat at El Charro Restaurant. Then I would go upstairs to look at the Museum. 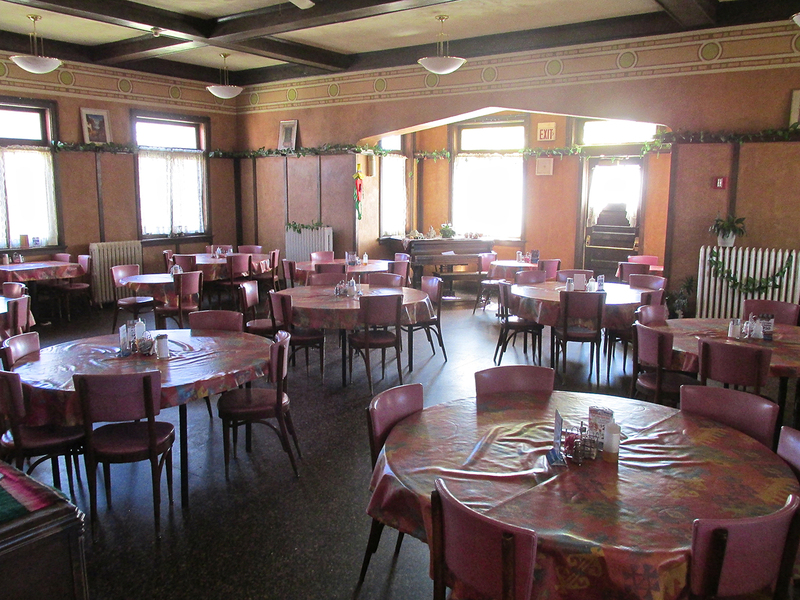 The main floor of The Harvey House is now occupied by El Charro Restaurant. The service and food was good. 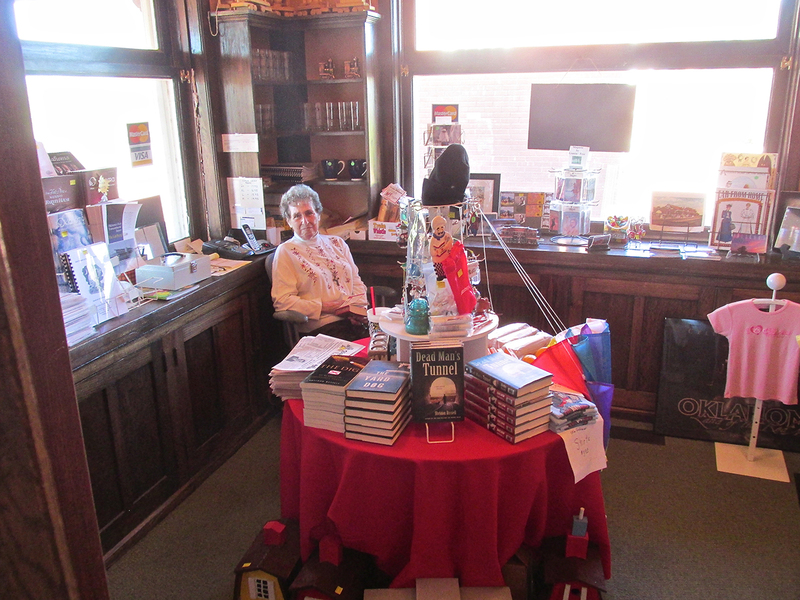 After I finished my lunch I stopped in the Gift Shop and spoke with Anita Bettencort. 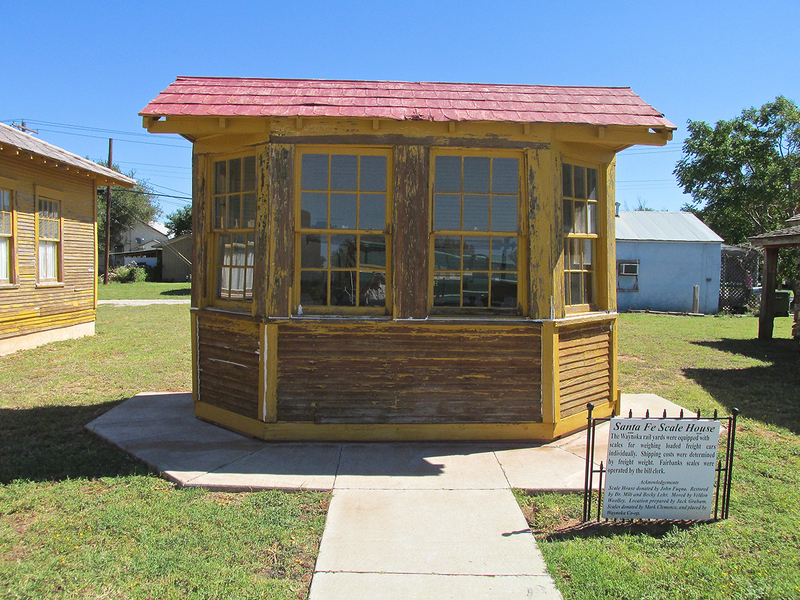 She is a member of The Waynoka Historical Society. 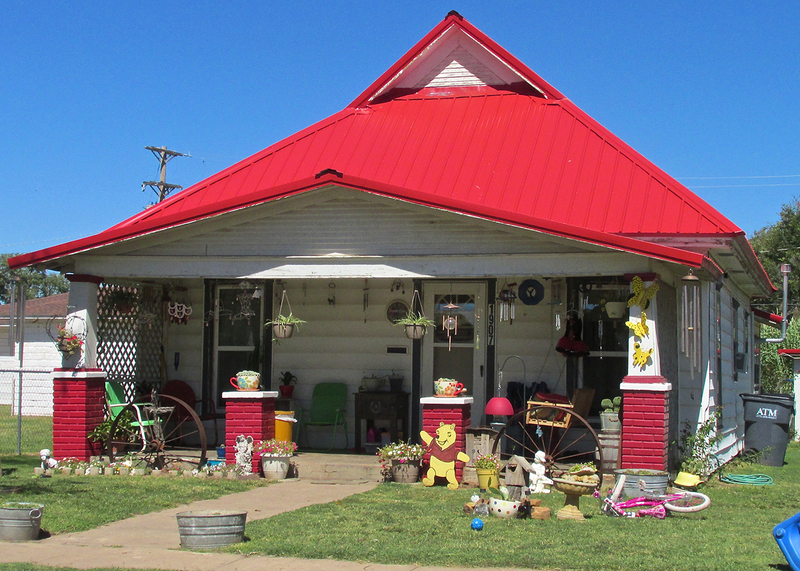 She has lived in Waynoka all her life after being born in Blackwell, Oklahoma. 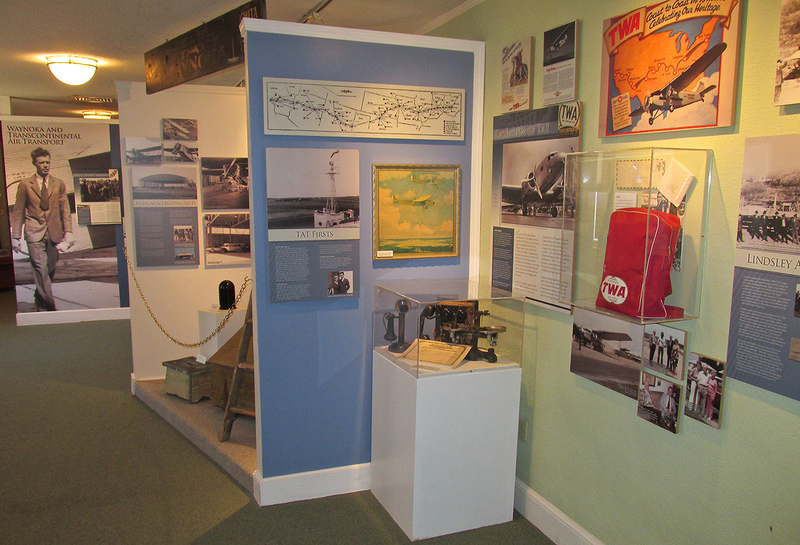 On the second floor of The Harvey House is the Museum containing artifacts and information about Fred Harvey’s business and Transcontinental Air Transport. It is very modern in design and interesting to tour. There was quite a bit to see but I only took a few pictures to give you a taste of it. I feel like a broken record on this, but my Fun Flight Method, which I have discussed many times, is predicated on flying under the wind in the morning and then catching it as a tailwind for the flight home (Catching The Wave). The weather forecast that day was panning out 100% accurate. So as the afternoon wore on I knew I needed to get airborne to take best advantage of the changing wind conditions. As the day progressed, the wind would swing from the West to the South. My best scenario would be to catch it during its Southwesterly mode. It was about 2 pm and the wind was doing exactly that. 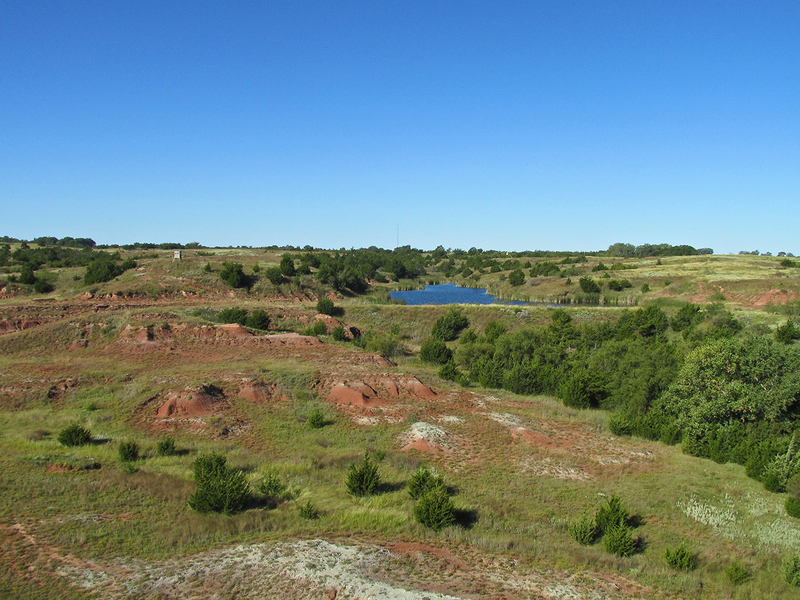 I had seen a good bit of Waynoka and it was time to go. 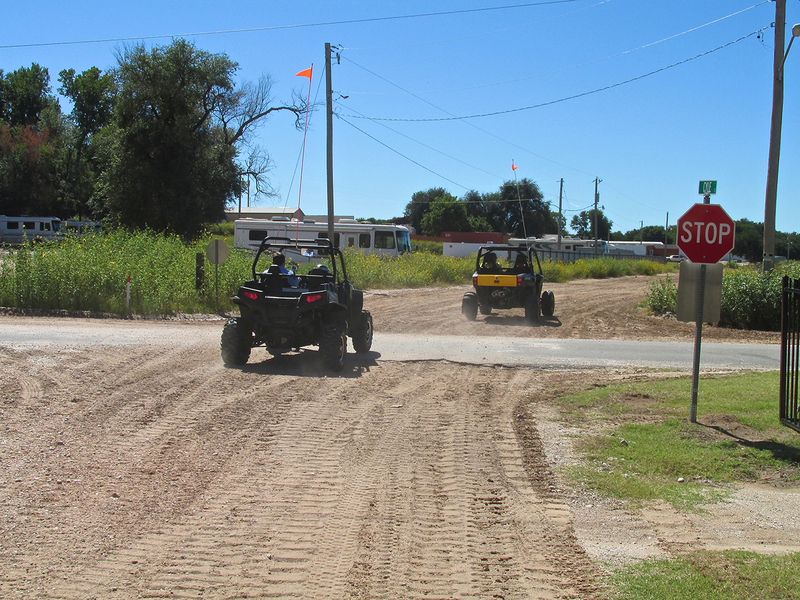 On the way back to the airport I saw Stewart’s Sand Sports on Hwy 281, the road to Little Sahara. After returning to the airport I unloaded my stuff, closed the windows, locked up the Courtesy Car and secured its key in the lockbox. 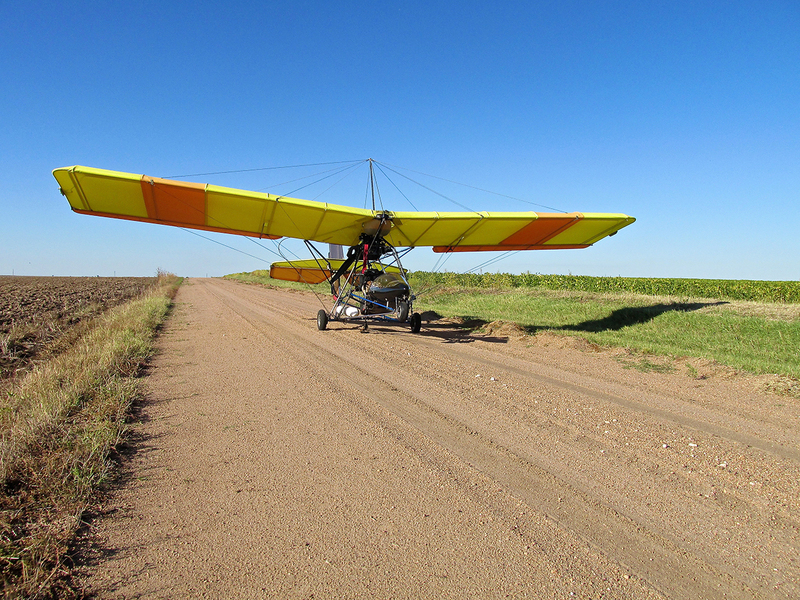 After a pre-flight walk-around of the Quicksilver, I fired it up and took to the air. 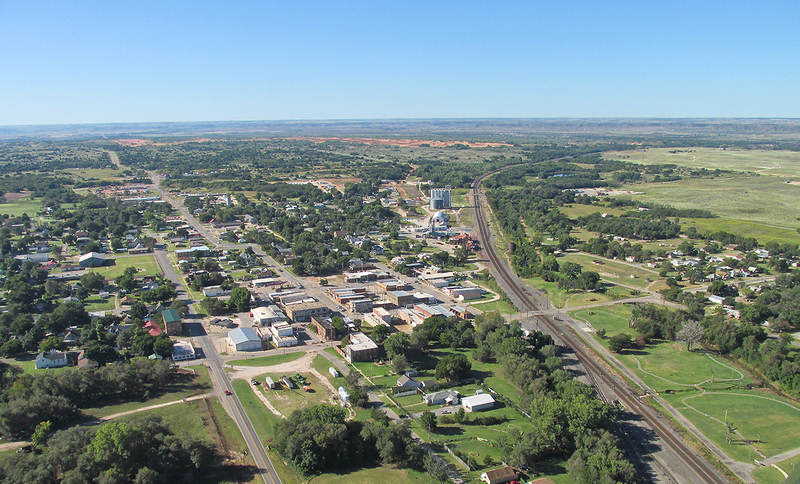 As per my Standard Operating Procedure, I took a few more pictures of Waynoka while leaving the area. 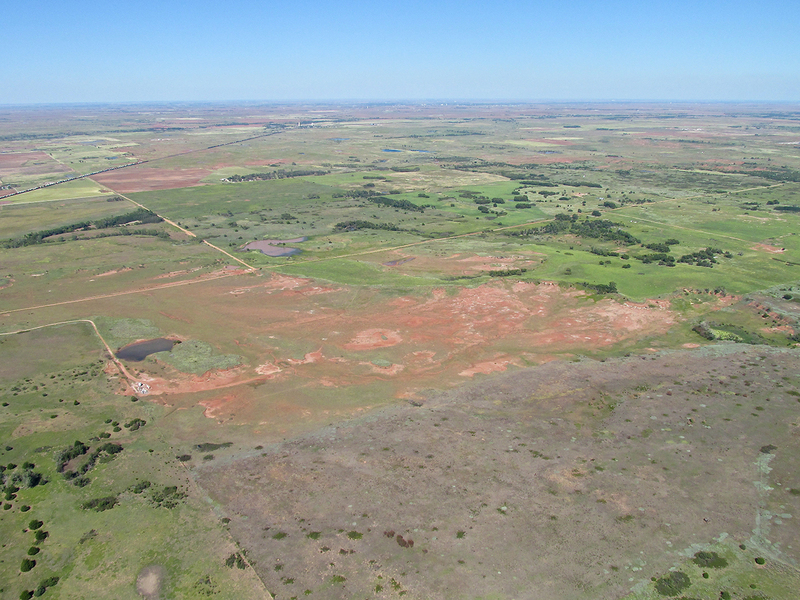 A mile from Waynoka at 800′ AGL looking Northwest. 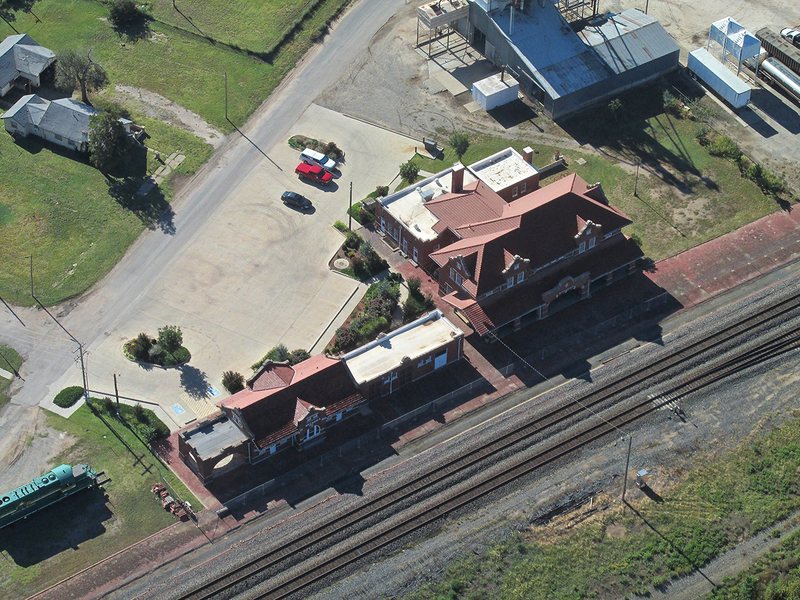 The Harvey House and Historical Area from 1,200′ AGL looking West. 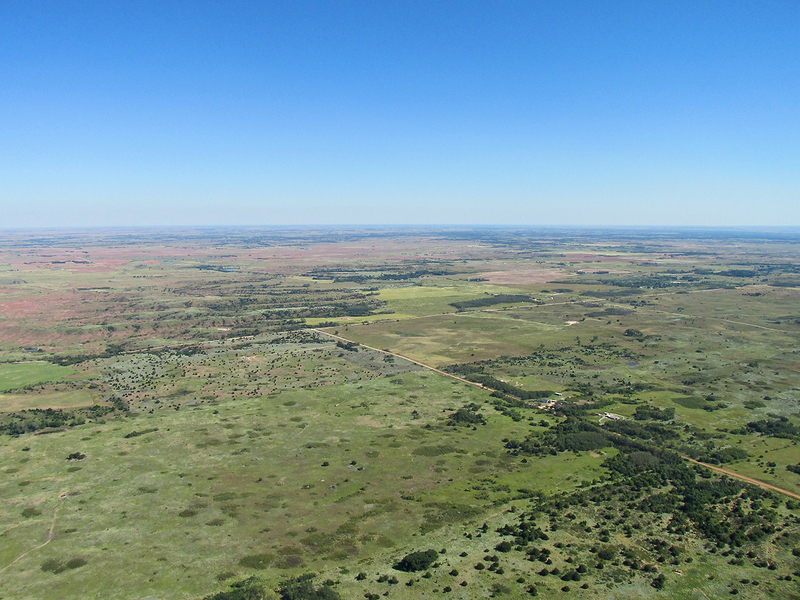 As I left the area I turned my plane back into the wind to get this last shot of Waynoka and Little Sahara. 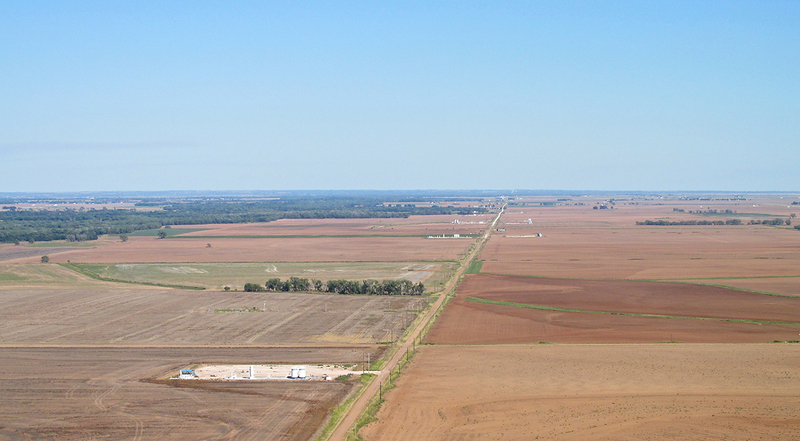 Looking South Southwest from 1,500′ AGL. After taking the previous photo I executed a 180 and took this. In the distance is Alva, Oklahoma. I am at 1,500′ AGL looking Northeast. To the right of my course, more of the grandeur of this landscape is revealed. This is from 1,800′ AGL looking Southeast. This telephoto from the same position isolates the picturesque bluff formations there. 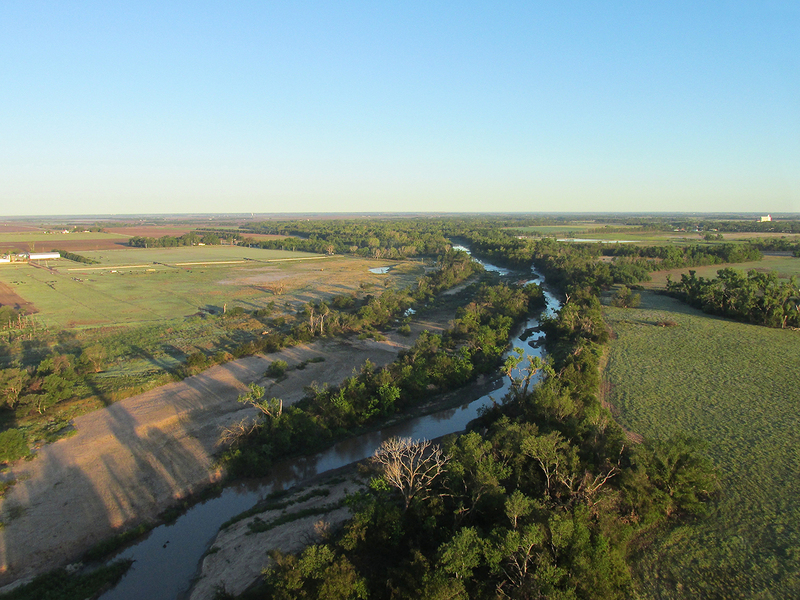 About 10 minutes out of Waynoka I saw this below me. I would call these “salt or alkali washes”. I am at 1,500′ AGL looking Northeast. Halfway between Waynoka and Alva I saw this plant. I think it is a gas pressurization and pumping station. Then a couple miles farther Northeast I saw this one. I am at 1,200′ AGL looking Northeast. Here is the previous facility as I passed by it. If you look closely you can see two construction cranes. It is a “work in progress”. My path took me directly over yet another gas plant. 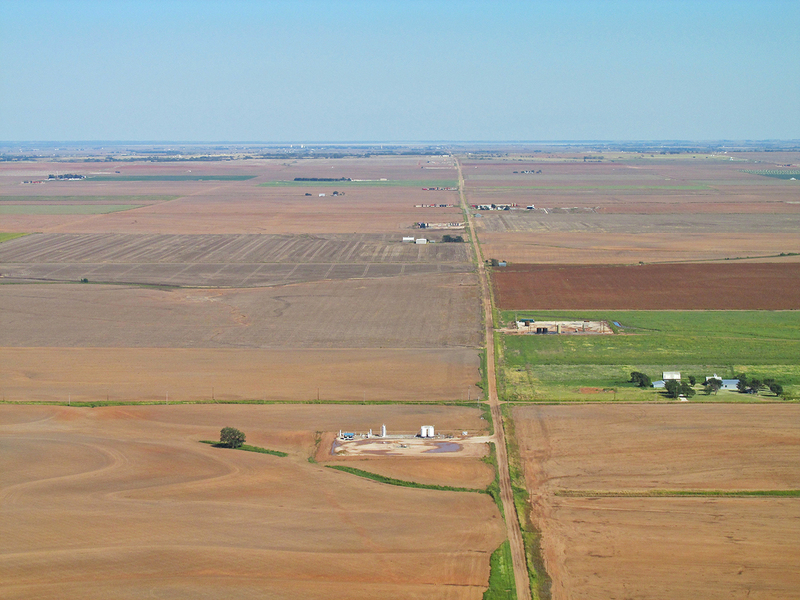 This one is due South of Alva, Oklahoma. 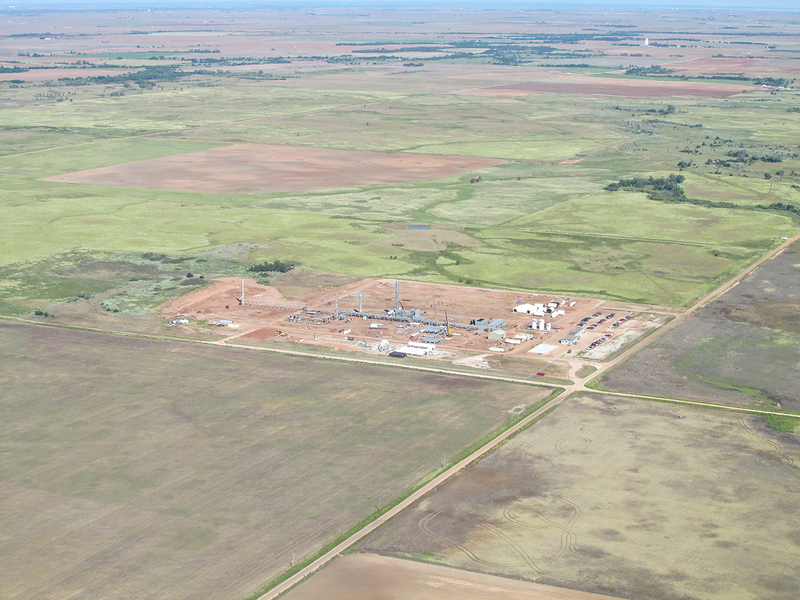 Below is a photo of Alva, Oklahoma from 1,000′ AGL looking North. 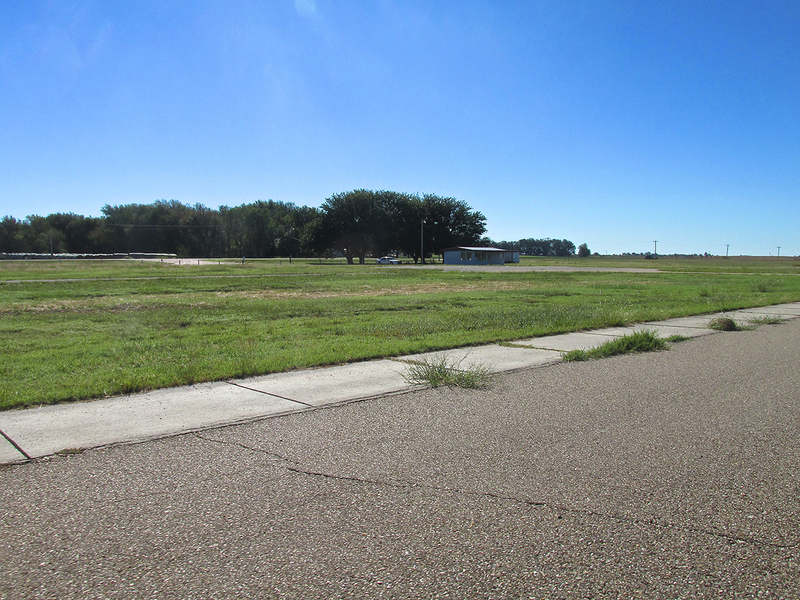 On a previous Sky Surfing Excursion I landed at the airport in the foreground – Alva Regional Airport. I wrote a story about Alva you can see HERE. 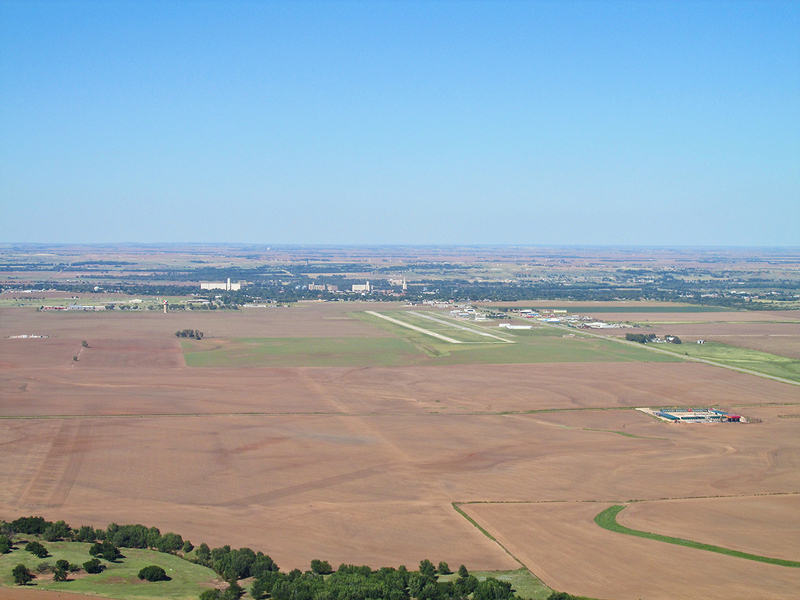 Alva, Oklahoma with Alva Regional Airport in the foreground. 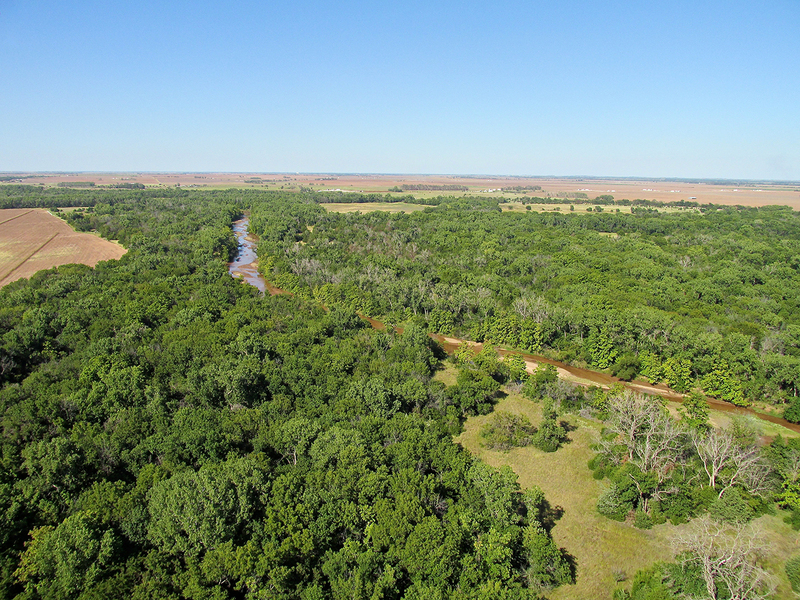 The next series of shots will give you an inkling as to the tremendous effort expended over the last few years in Oil and Gas exploration near the border of Kansas and Oklahoma. These are all different “rows” of installations stretching for miles. 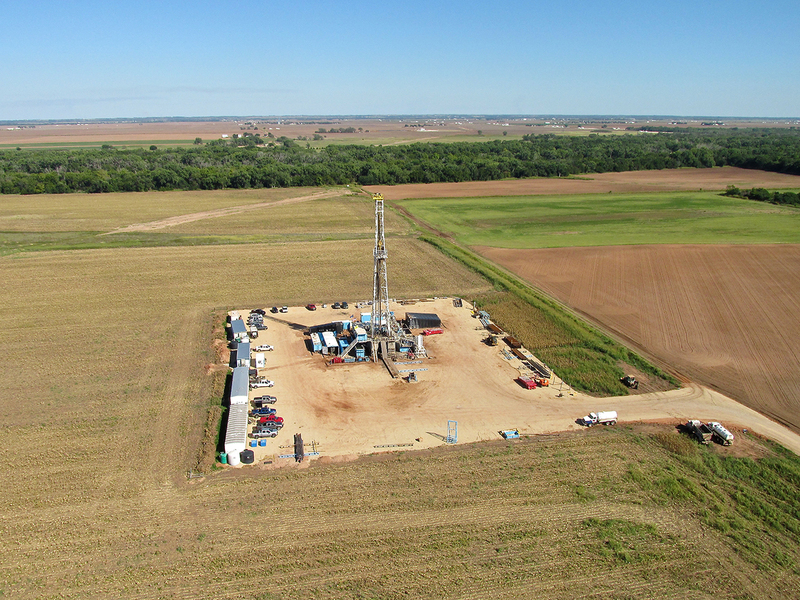 Normally wells are drilled directly over the suspected pool. These installations are strung out evenly along county roads. My guess is that they are Horizontal Fracking efforts. 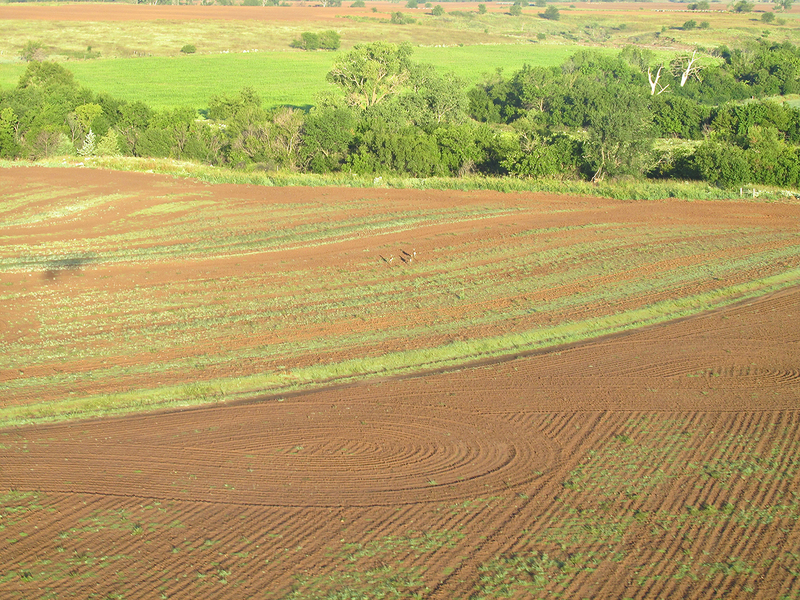 The Oil Boom hasn’t stopped the farming, though. 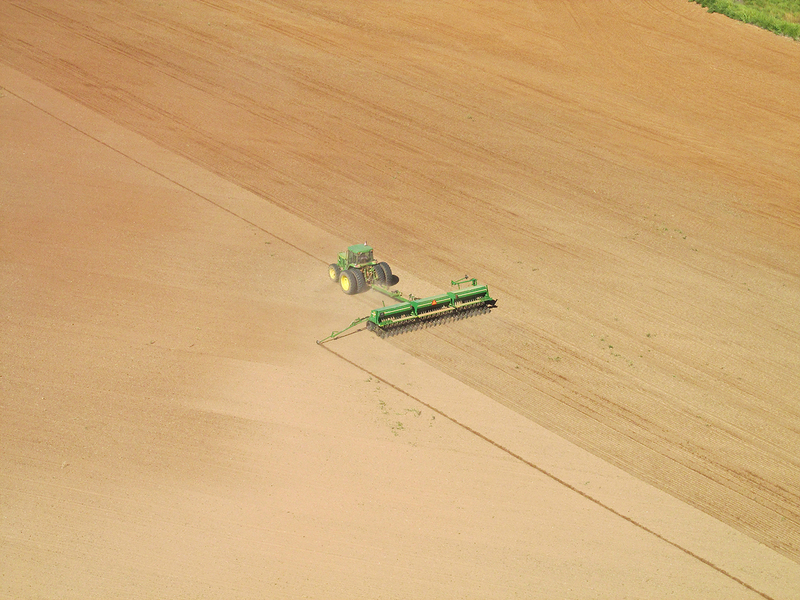 This big John Deere is laying down some seed. I hate when this happens… I spent 20 minutes pouring over my satellite map trying to determine what town this is to no avail. It seems to be thriving without my recognition nonetheless. I’m now crossing the Medicine Lodge River. 200′ AGL looking Northwest. In the distance you can see more Oil & Gas activity I will be crossing. 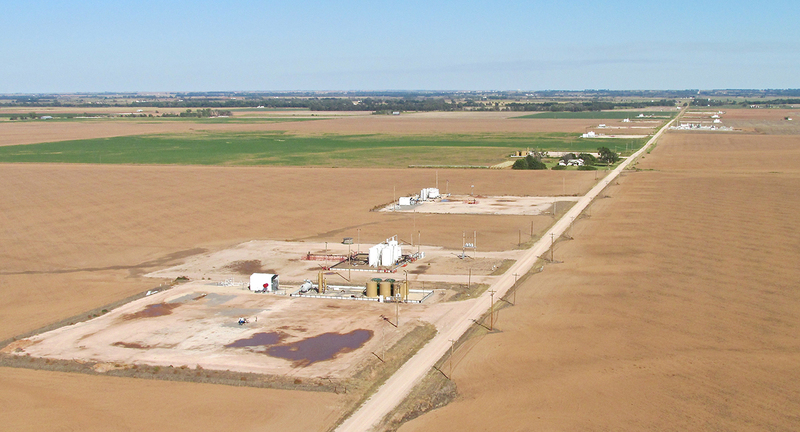 These next three Oil & Gas Exploration Zones are a few miles Southwest of Argonia, Kansas. Argonia is interesting for at least two reasons (and no doubt many more). One is shown below is Argonia’s Power Plant. They generate their own electricity. Number two is their hosting of the Annual Amateur High Power Rocket Shoot. I produced a documentary on this sport called “A Beginner’s Guide to Amateur High Powered Rocketry“. While working on the piece I visited Argonia on several occasions to gather interviews and footage. OK, Three Things… Argonia also maintains a nice grass field airport on its Northeast side on which I have landed many times. Aviators have always looked to a town’s water tower for identification. 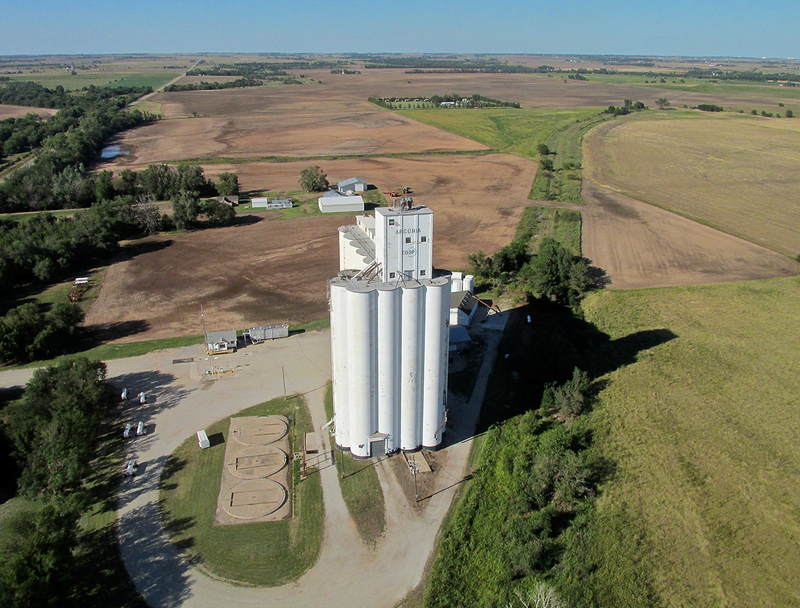 Grain elevators work good, too. To the South I saw this impressive smoke plume rising a couple of thousand feet. 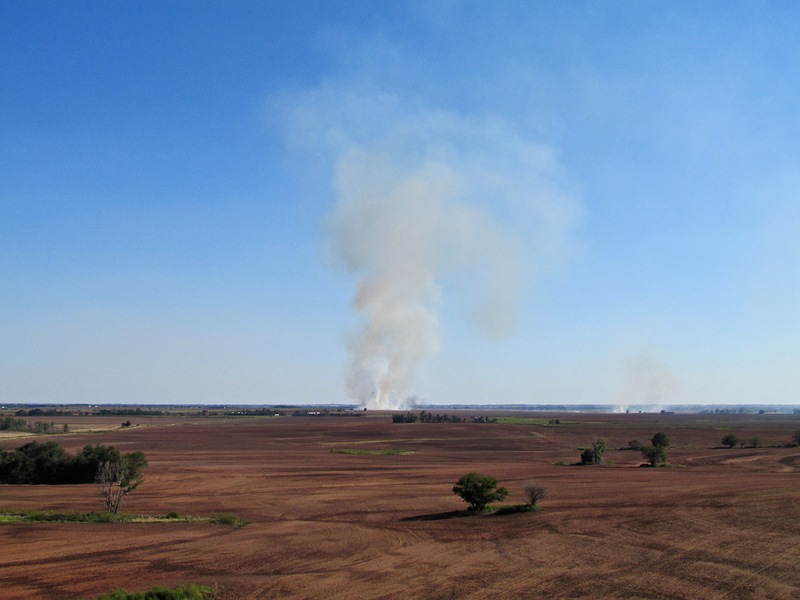 Shot from 3oo’ AGL looking South. Permit me to indulge in a couple more portraits of my ride. 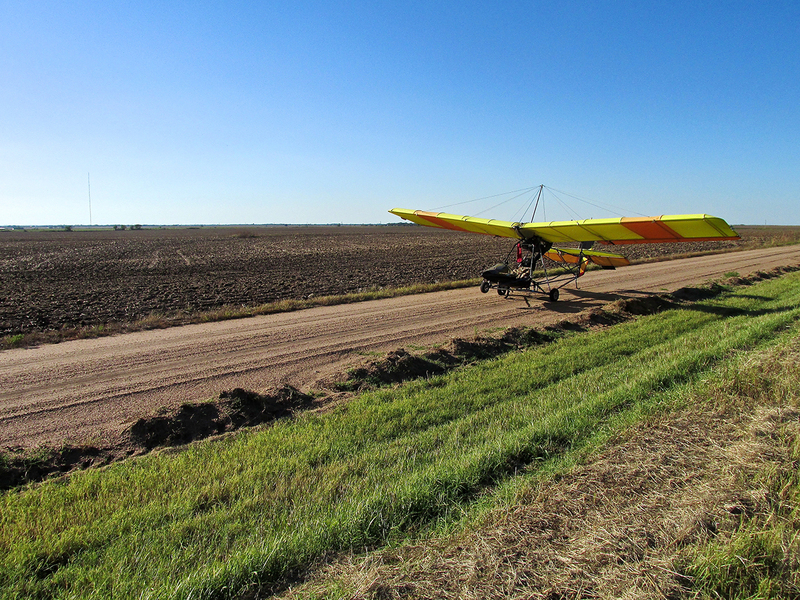 I was nearing my home base but, not ready to conclude the flight, I made a serendipitous landing on a county road. The wind was nil so I took a few moments to compose some shots: Quicksilver On The Kansas Prairie. 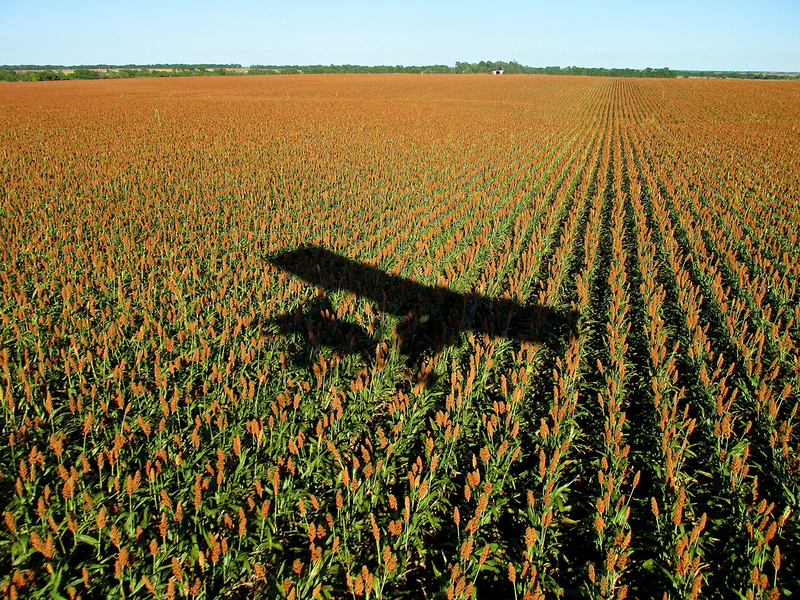 Right after takeoff I was skimming the hedgerows when I came upon this glorious milo field. Milo in itself at this time in its growth cycle is beautiful; the green flood plain weaving through it intensified the value of this wonderful scene. The air was stable and clear. CAVU – Ceiling and Visibility Unlimited! 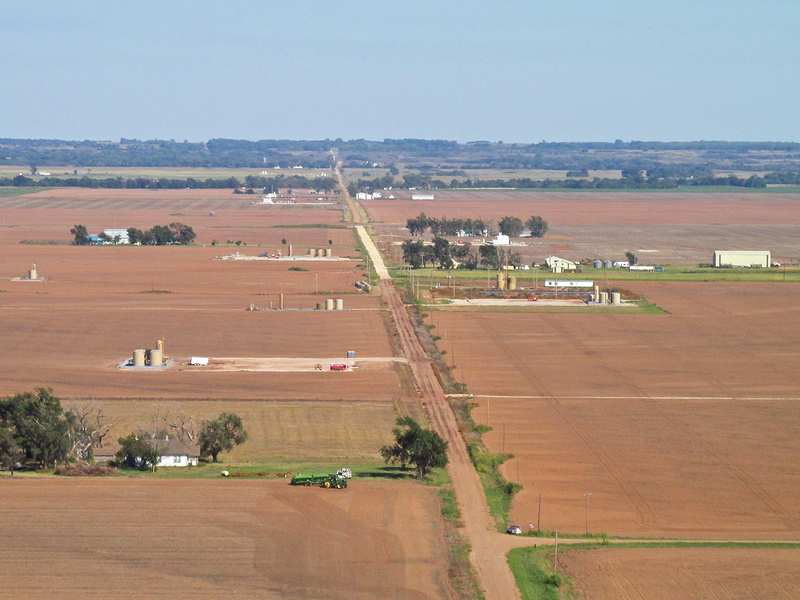 Still not wanting to touch down, I circled to attempt some pictures of the Wichita Metro Area North of Selby Aerodrome. Most of my efforts to date have been hampered by haze and humidity. The next two shots are the best so far. 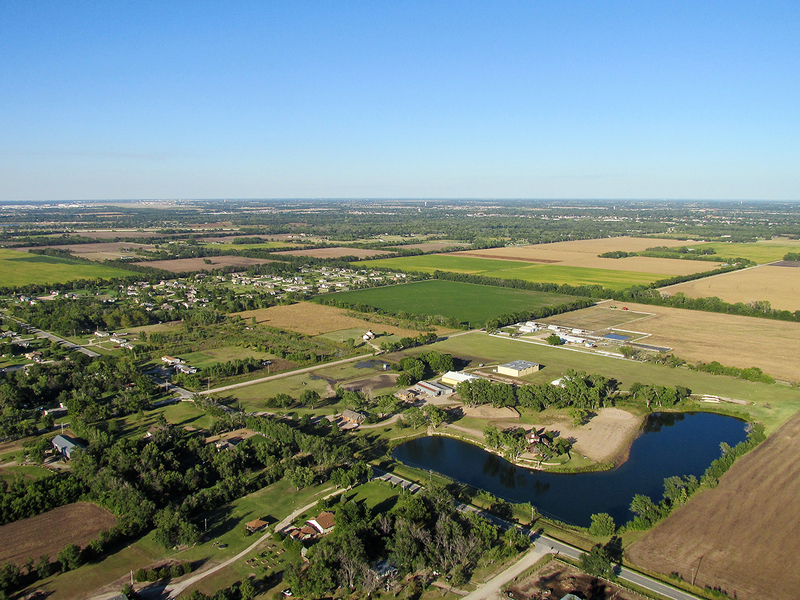 From the same position over Selby Aerodrome, I worked on a panoramic and a telephoto. Below I present the best of the litter. 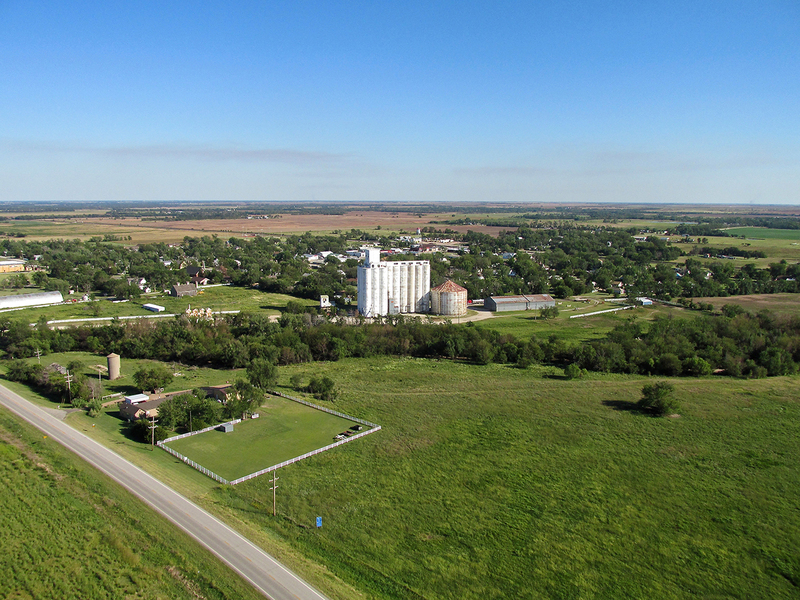 This is from 900′ AGL looking Northeast toward Augusta, Kansas, Selby Field in the foreground. The Skyline of Wichita, Kansas from 11 miles South. 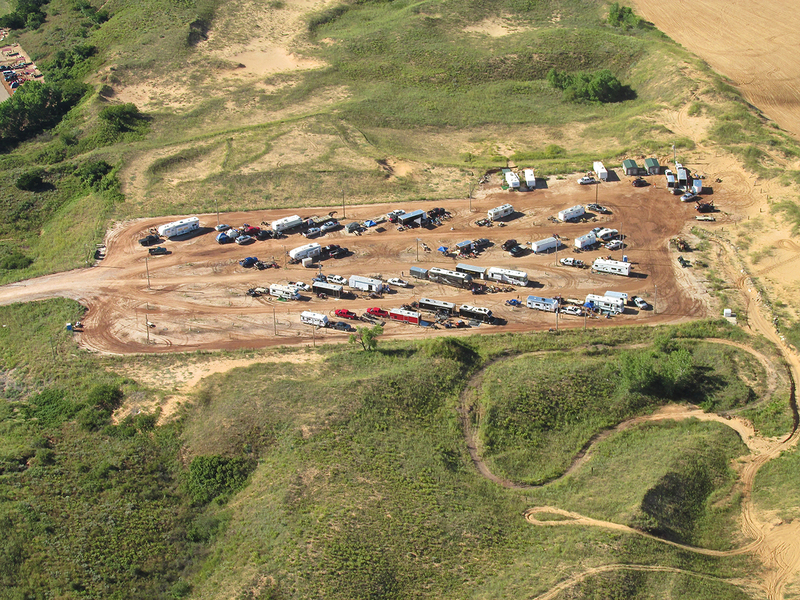 Oil and Gas, Farming, Sand Dunes, History, Good Food, Friendly People. Another good one . 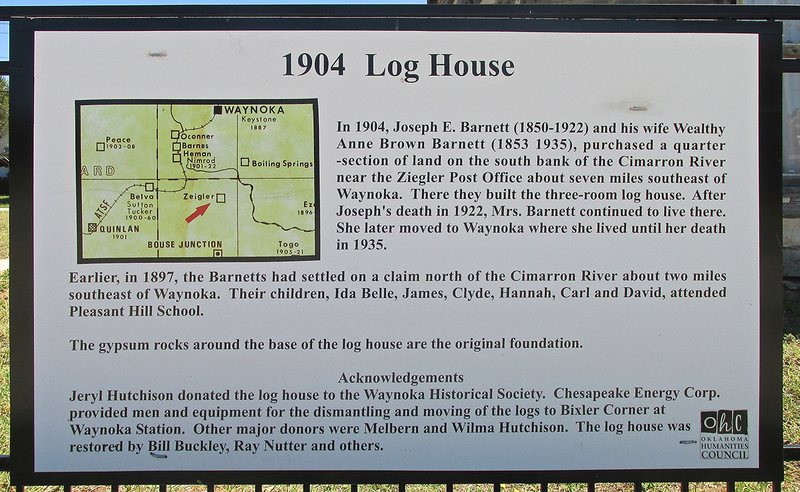 Have fond memories of Waynoka. They were about the only team we could beat in football. 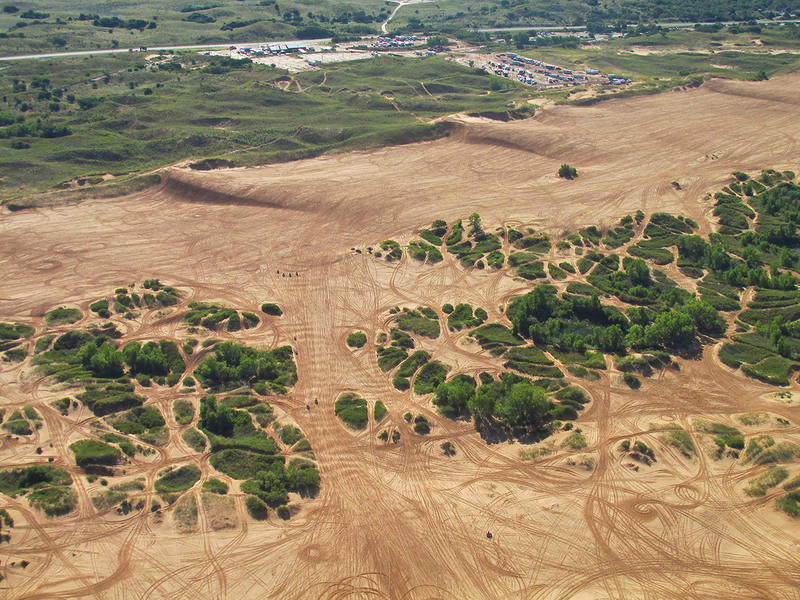 Before the Sand buggies used to be favorite site for church and scout group outings. Dunes always seemed bigger than your pictures . There has to be a Ken Burns Type tv reality show in your future. Thanks! I’m glad you liked it. It is a very interesting place. I know what you mean about how the dunes look in the pictures. I think shooting them with the wide angle lens tends to make them seem smaller. Also, I was at 1,000′ when I shot a lot of them and that didn’t help either. When you look at the guys out there on their 4 wheelers, though, the size relationship made more sense. I have another one I am writing about Attica, Kansas. Thanks! I’m glad you liked it. Now you have another place to visit. I think you will like it when you do. Let me know when you are in town. Glad you liked it. I like that shot a lot and also the milo photo near the end of the report. I’m sure you will like it. When you go, I think you would appreciate a swing a little farther West and South before or after landing to see the territory there. I didn’t have enough fuel at the time. Next time I will cover those areas, too. Wow, Brian. Great pictures! Clear and distinct! And I had never known what “flaring” is. Thanks. That flare was intense. You can cook hot dogs on it for all your friends at once. adventures to the Little Sahara or Wynoka, OK.
I’m glad you got to see it. 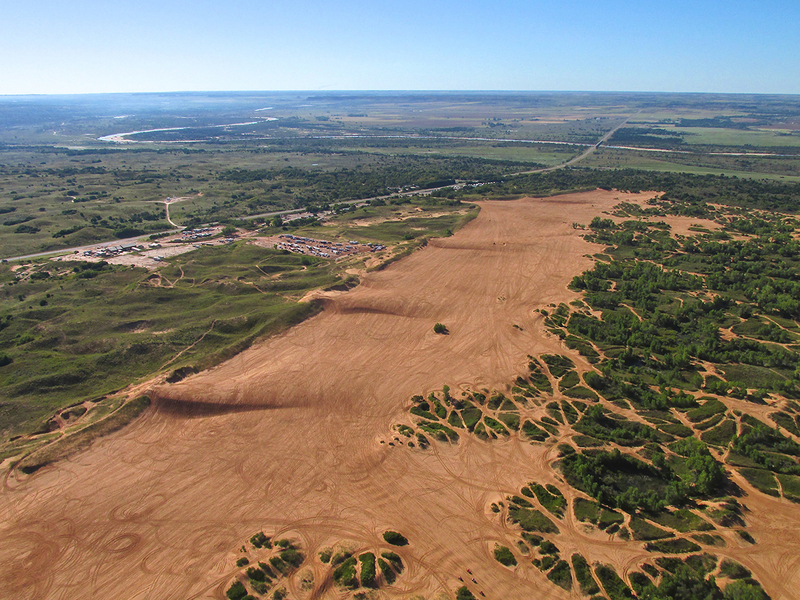 I figured you would like to see aerials of all the development around the border. Excellent Brian. And ~ I enjoy reading other’s comments too. I plan to have more adventures on The Flite Blog this 2014 Season. Also I will be releasing more movies on my YouTube Channel.